Text was checked in part from the Peter Pauper Press edition,Mount Vernon, New York 1940. Scanned illustrations for electronic text. Added figure tags. Additional tagging, including image location. Additional corrections of ! Basic TEI SGML tagging, UVA Header added, spell-checked, unambiguous lin! ONE thing was certain, that the white kitten had had nothing to do with it -- it was the black kitten's fault entirely. For the white kitten had been having its face washed by the old cat, for the last quarter of an hour (and bearing it pretty well, considering); so you see that it couldn't have had any hand in the mischief. 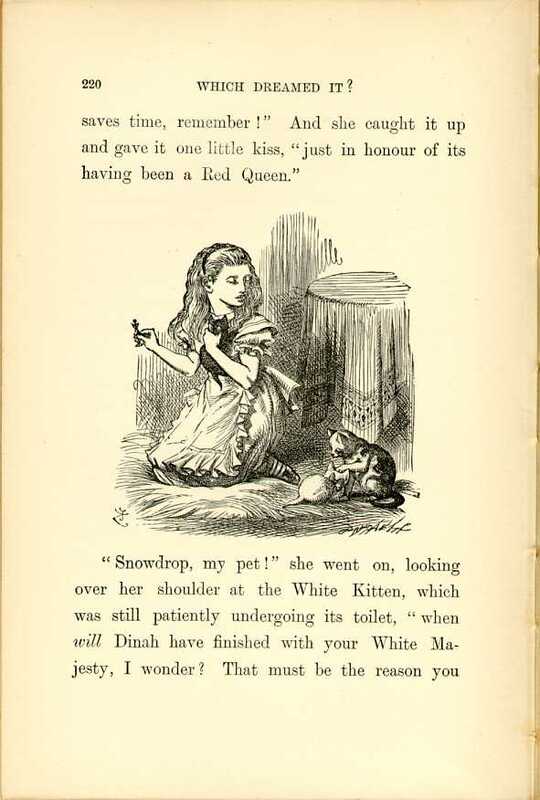 The way Dinah washed her children's faces was like this: first she held the poor thing down by its ear with one paw, and then with the other paw she rubbed its face all over, the wrong way, beginning at the nose: and just now, as I said, she was hard at work on the white kitten, which was lying quite still and trying to purr -- no doubt feeling that it was all meant for its good. 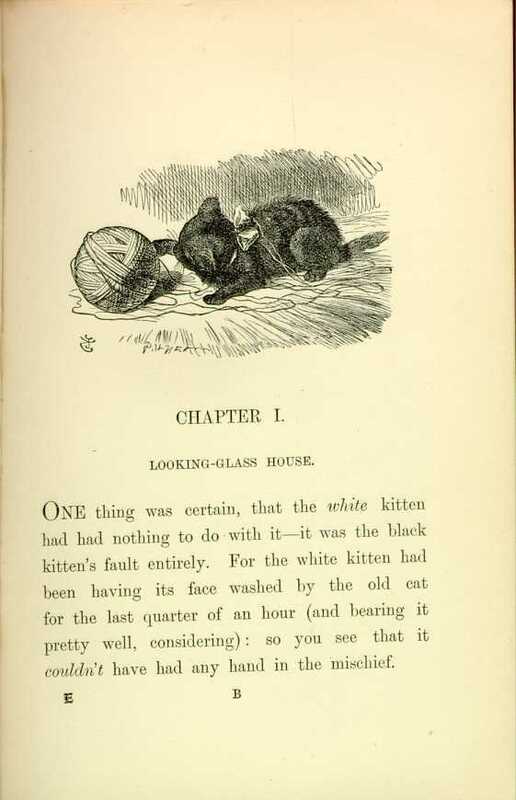 But the black kitten had been finished with earlier in the afternoon, and so, while Alice was sitting curled up in a corner of the great arm-chair, half talking to herself and half asleep, the kitten had been having a grand game of romps with the ball of worsted Alice had been trying to wind up, and had been rolling it up and down till it had all come undone again; and there it was spread over the hearth-rug, all knots and tangles, with the kitten running after its own tail in the middle. 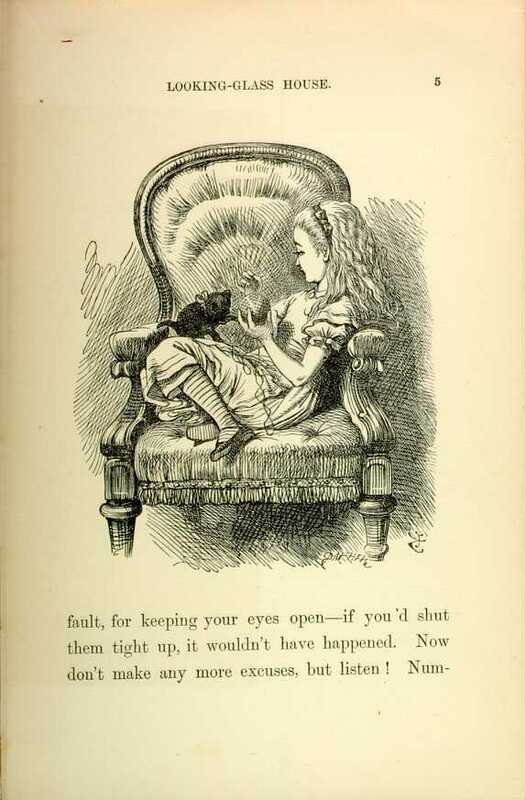 Alice, catching up the kitten, and giving it a little kiss to make it understand that it was in disgrace. "Really, Dinah ought to have taught you better manners! You ought, Dinah, you know you ought!" she added, looking reproachfully at the old cat, and speaking in as cross a voice as she could manage -- and then she scrambled back into the arm-chair, taking the kitten and worsted with her, and began winding up the ball again. But she didn't get on very fast, as she was talking all the time, sometimes to the kitten, and sometimes to herself. Kitty sat very demurely on her knee, pretending to watch the progress of the winding, and now and then putting out one paw and gently touching the ball, as if it would be glad to help if it might. they had to leave off. Never mind, Kitty, we'll go and see the bonfire to-morrow." 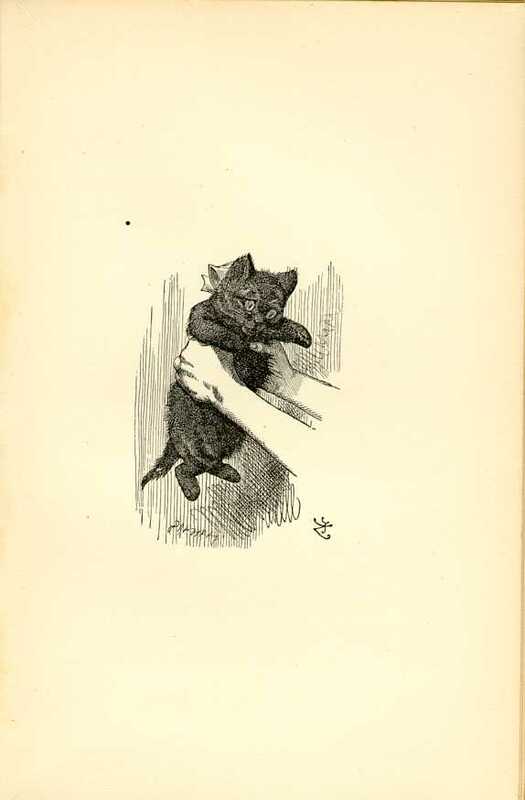 Here Alice wound two or three turns of the worsted round the kitten's neck, just to see how it would look: this led to a scramble, in which the ball rolled down upon the floor, and yards and yards of it got unwound again. "Do you know, I was so angry, Kitty," Alice went on, as soon as they were comfortably settled again, "when I saw all the mischief you had been doing, I was very nearly opening the window, and putting you out into the snow! And you deserved it, you little mischievous darling! What have you got to say for yourself? Now don't interrupt me!" she went on, holding up one finger. "I'm going to tell you all your faults. Number one: you squeaked twice while Dinah was washing your face this morinng. Now you can't deny it, Kitty, for I heard you! What's that you say?" (pretending that the kitten was speaking). "Her paw went into your eye? Well, that's your fault, for keeping your eyes open -- if you'd shut them tight up, it wouldn't have happened. Now don't make any more excuses, but listen! Number two: you pulled Snowdrop away by the tail just as I had put down the saucer of milk before her! What, you were thirsty, were you? How do you know she wasn't thirsty too? Now for number three: you unwound every bit of the worsted while I wasn't looking! "That's three faults, Kitty, and you've not been punished for any of them yet. You know I'm saving up all your punishments for Wednesday week -- suppose they had saved up all my puinshments!" she went on, talking more to herself than the kitten. "What would they do at the end of a year? I should be sent off to prison, I suppose, when the day came. Or -- let me see -- suppose each punishment was to be going without a dinner: then, when the miserable day came, I should have to go without fifty dinners at once! Well, I shouldn't mind that much! I'd far rather go without them than eat them! -- oh, that's very pretty!" cried Alice, dropping the ball of worsted to clap her hands. "And I do so wish it was true! I'm sure the woods look sleepy in the autumn, when the leaves are getting brown. frightened her old nurse by shouting suddenly in her ear, "Nurse! Do let's pretend that I'm a hungry hyaena, and you're a bone!" But this is taking us away from Alice's speech to the kitten. "Let's pretend that you're the Red Queen Kitty! Do you know, I think, if you sat up and folded your arms, you'd look exactly like her. Now do try, there's a dear!" 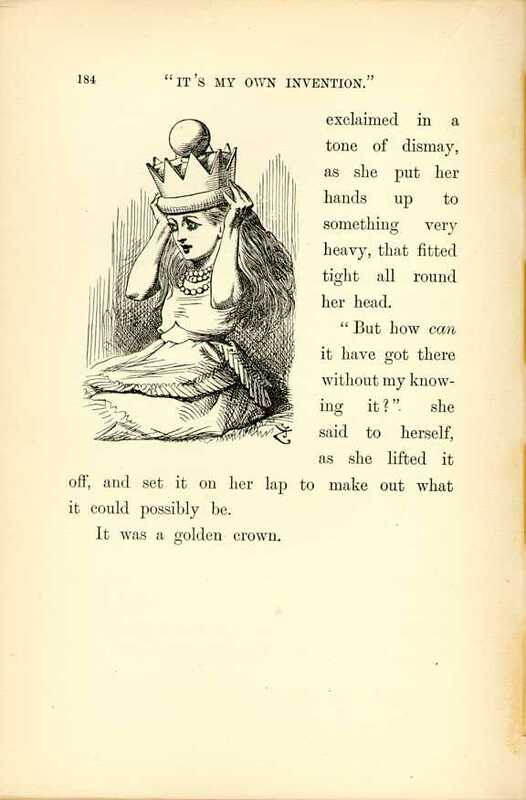 And Alice got the Red Queen off the table, and set it up before the kitten as a model for it to imitate: however, the thing didn't succeed, principally, Alice said, because the kitten wouldn't fold its arms properly. So, to punish it, she held it up to the Looking-glass, that it might see how sulky it was " -- and if you're not good directly," she added, "I'll put you through into Looking-glass House. How would you like that? the bit just behind the fireplace. Oh! I do so wish I could see that bit! I want so much to know whether they've a fire in the winter: you never can tell, you' know, unless our fire smokes, and then smoke comes up in that room too -- but that may be only pretence, just to make it look as if they had a fire. Well then, the books are something like our books, only the words go the wrong way; I know that, because I've held up one of our books to the glass, and then they hold up one in the other room. beginning to melt away, just like a bright silvery mist. 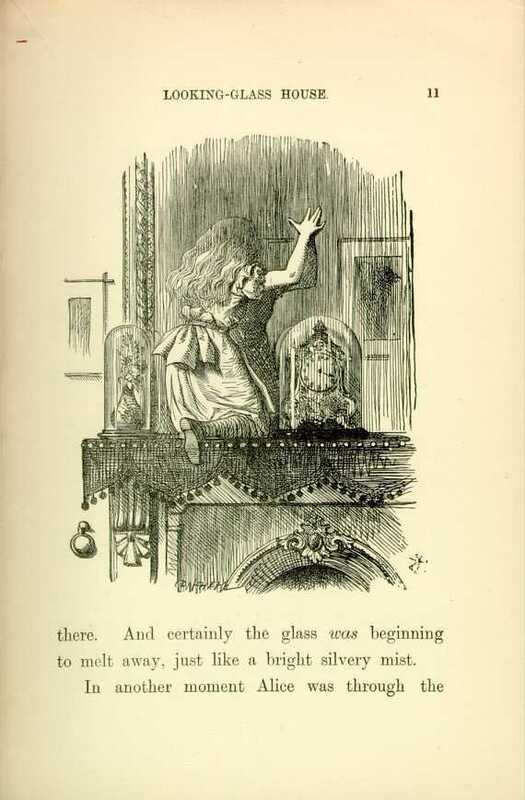 In another moment Alice was through the glass, and had jumped lightly down into the Looking-glass room. The very first thing she did was to look whether there was a fire in the fireplace, and she was quite pleased to find that there was a real one and lazing away as brightly as the one she had left behind. "So I shall be as warm here as I was in the old room," thought Alice: "warmer, in fact, because there'll be no one here to scold me away from the fire. Oh, what fun it'll be, when they see me through the glass in here, and can't get at me!" "They don't keep this room so tidy as the other" Alice thought to herself, as she noticed several of the chessmen down in the hearth among the cinders: but in another moment, with a little "Oh!" of surprise, she was down on her hands and knees watching them. The chessmen were walking about, two and two!" "Here are the Red King and the Red Queen," Alice said (in a whisper, for fear of frightening them), "and there are the White King and the White" Queen sitting on the edge of the shovel -- and here are two Castles walking arm in arm -- I don't think they can hear me," she went on, as she put her head closer down, "and I'm nearly sure they can't see me. 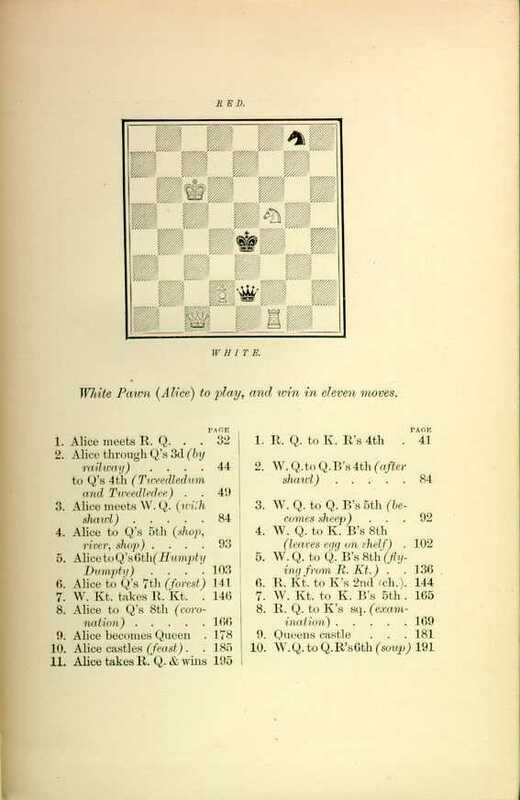 I feel as if I were invisible -- -"
Here something began squeaking on the table, and made Alice turn her head just in time to see one of the White Pawns roll over and begin kicking: she watched it with great curiosity to see what would happen next. cried out, as she rushed past the King, so violently that she knocked him over among the cinders "My precious Lily! My imperial kitten!" and she began scrambling wildly up the side of the fender -- Imperial fiddlestick!" said the King, rubbing his nose, which had been hurt by the fall. He had a right to be a little annoyed for he was covered with ashes from head to foot. the poor little Lily was nearly screaming herself into a fit, she hastily picked up the Queen and set her upon the table by the side of her noisy little daughter. The Queen gasped, and sat down: the rapid journey through the air had quite taken away her breath, and for a minute or two she could do nobut hug the little Lily in silence. As soon as she had recovered her breath a little, she called out to the White King, who was sitting sulkily among the ashes, "Mind the volcano!" "Blew -- me -- up," panted the Queen, who was still a little out of breath. "Mind you come up -- the regular way-don't get blown up!" found himself held in the air by an invisible hand, and being dusted: he was far too much astonished to cry out, but his eyes and his mouth went on getting larger and larger, and rounder and rounder, till her hand shook so with laughing that she nearly let him drop upon the floor. "Oh! please don't make such faces, my dear!" she cried out, quite forgetting that the King couldn't hear her. "You make me laugh so that I can hardly hold you! And don't keep your mouth so wide open! All the ashes will get into it -- there, now I think you're tidy enough!" she added, as she smoothed his hair, and set him down very carefully upon the table near the Queen. The King was saying, "I assure you, my dear, I turned cold to the very ends of my whiskers!" To which the Queen replied, "You haven't got any whiskers." Alice looked on,with great interest as the King took an enormous memorandum-book out of his pocket, and began writing. A sudden thought struck her, and she took hold of the end of the pencil, which came some way over his shoulder, and began writing for him. The poor King looked puzzled and unhappy, and struggled with the pencil for some time without saying anything; but Alice was too strong for him, and at last he panted out, "My dear! I really must get a thinner pencil. I can't manage this one a bit; "it writes all manner of things that I don't intend -- -"
"What manner of things?" 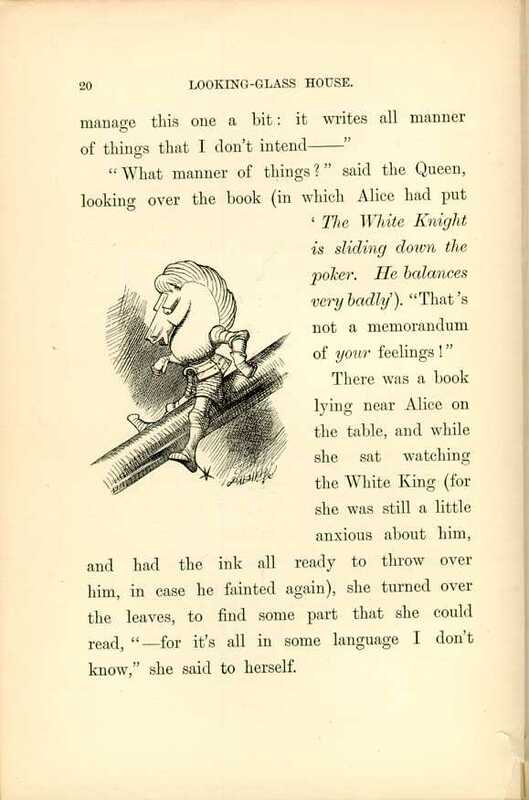 said the Queen, looking over the book (in which Alice had put "The White Knight is sliding down the poker. he balances very badly"). "That's not a memorandum of your feelings!" I don't know," she said to herself. It was like this. She puzzled over this for some time, but at last a bright thought struck her. "Why, it's a Looking-glass book of course! And if I hold it up to a glass, the words will all go the right way again." This was the poem that Alice read. seems to fill my head with ideas -- only I don't exactly know what they are! However, somebody killed something: that's clear, at any rate -- -"
"But oh!" 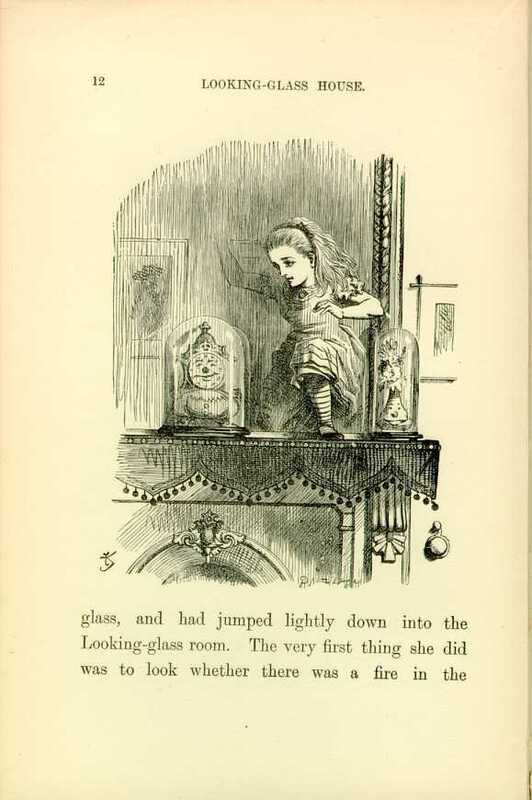 thought Alice, suddenly jumping up, "if I don't make haste I shall have to go back through the Looking-glass, before I've seen what the rest of the house is like! Let's have a look at the garden first!" She was out of the room in a moment, and ran downstairs -- or, at least, it wasn't exactly running, but a new invention for getting downstairs quickly and easily, as Alice said to herself. She just kept the tips of her fingers on the hand-rail, and floated gently down without even touching the stairs with her feet; then she floated on through the hall, and would have gone straight out at the door in the same way, if she hadn't caught hold of the door-post. She was getting a little giddy with so much floating in the air, and was rather glad to find herself walking again in the natural way. "The Garden of Live Flowers"
I SHOULD see the garden far better," said Alice to herself, "if I could get to the top of that hill: and here's a path that leads straight to it -- at least, no, it doesn't do that -- -" (after going a few yards along the path, and turinng several sharp corners), "but I suppose it will at last. But how curiously it twists! It's more like a corkscrew than a path! Well, this turn goes to the hill, I suppose -- no, it doesn't! This goes straight back to the house! Well then, I'll try it the other way." And so she did: wandering up and down, and "trying turn after turn, but always coming back to the house, do what she would. Indeed, once, when she turned a corner rather more quickly than usual, she ran against it before she couId stop herself. So, resolutely turning her back upon the house she set out once more down the path, determined to keep straight on till she got to the hill. For a few minutes all went on well, and she was just saying, "I really shall do it this time -- -" when the path gave a sudden twist and shook itself (as she described it afterwards), and the next moment she found herself actually walking in at the door. away. At length, as the Tiger-lily only went on waving about, she spoke again, in a timid voice -- almost in a whisper. "And can all the flowers talk?" "It isn't manners for us to begin, you know," said the Rose, "and I really was wondering when you'd speak! Said I to myself. "Her face has got some sense in it, though it's not a clever one!' Still you're the right colour, and that goes a long way." Alice didn't like being criticised, so she began asking questions: "Aren't you sometimes frightened at being planted out here, with nobody to take care of you?" "There's the tree in the middle," said the Rose. why its branches are called boughs!" "Didn't you know that?" cried another Daisy, and here they all began shouting together, till the air seemed quite full of little shrill voices. "Silence, every one of you!" cried the Tiger-lily, waving itself passionately from side to side, and trembling with excitement. "They know I can't get at them!" panted, bending its quivering head towards Alice, "or they wouldn"t dare do it!" "Never mind!" Alice said in a soothing tone, and stooping down to the daisies, who were just be ginning again, she whispered, "If you don't hold your tongues, I'll pick you!" "In most gardens," the Tiger-lily said, "they make the beds too soft -- so that the flowers are always asleep." "It's my opinion you never think at all," the Rose said in a rather severe tone. "Hold your tongue!" cried the Tiger-lily. "As if you ever saw anybody! You keep your head under the leaves, and snore away there till you know no more what's going on in the world, than if you were a bud!" "There's one other flower in the garden that can move about like you," said the Rose. 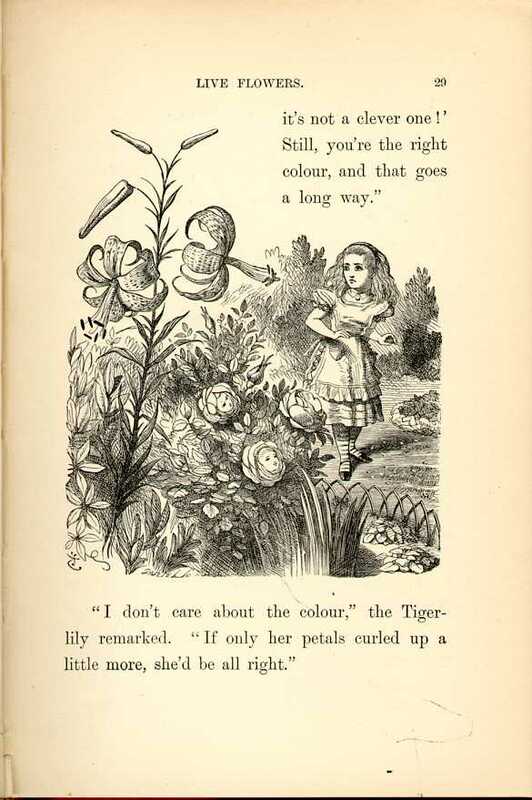 "I wonder how you do it -- -" ("You're always wondering," said the Tiger-lily), "but she's more bushy than you are." "Is she like me?" Alice asked eagerly, for the thought crossed her mind. "There's another little girl in the garden somewhere!" "Well, she has the same awkward shape as you," the Rose said: "but she's redder -- and her petals are shorter, I think." "But that's not your fault," the Rose added kindly: "you're beginning to fade, you know -- and then one can't help one's petals getting a little untidy." Alice didn't like this idea at all: so, to change the subject, she asked, "Does she ever come out here?" "I daresay you'll see her soon," said the Rose, "She's one of the thorny kind." "Why, all round her head, of course," the Rose replied. "I was wondering you hadn't got some too. I thought it was the regular rule." "She's coming!" cried the Larkspur. "I hear her footstep, thump, thump, along the gravel-walk!" Alice looked round eagerly, and found that it was the Red Queen. "She's grown a good deal!" was her first remark. 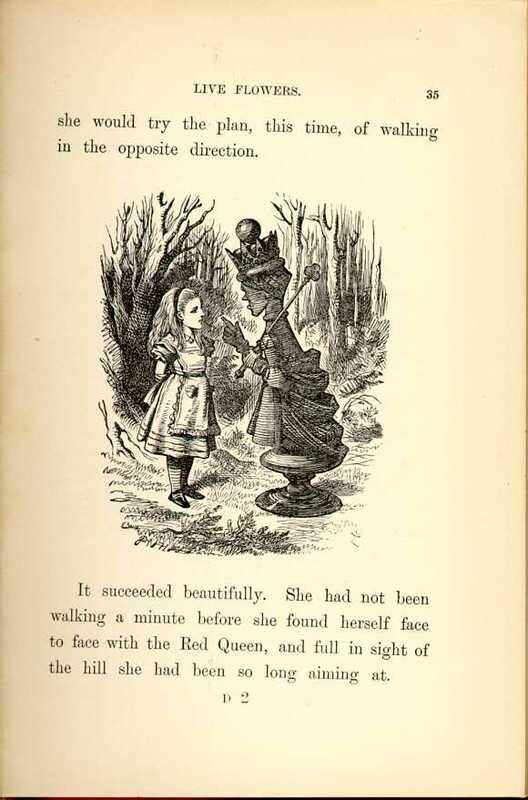 She had indeed: when Alice first found her in the ashes, she had been only three inches high -- and here she was, half a head taller than Alice herself! "I think I'll go and meet her," said Alice, for, though the flowers were very interesting, she felt that it would be far grander to have a talk with a real Queen. "You can't possibly do that," said the Rose: "I should advise you to walk the other way." This sounded nonsense to Alice so she said nothing, but set off at once towards the Red Queen. To her surprise, she lost sight of her in a moment, and found herself walking in at the front-door again. the plan, this time, of walking in the opposite direction. "I don't know what you mean by your way," said the Queen : "all the ways about here belong to me -- but why did you come out here at all?" she added in a kinder tone. "Curtsey while you're thinking what to say. It saves time." 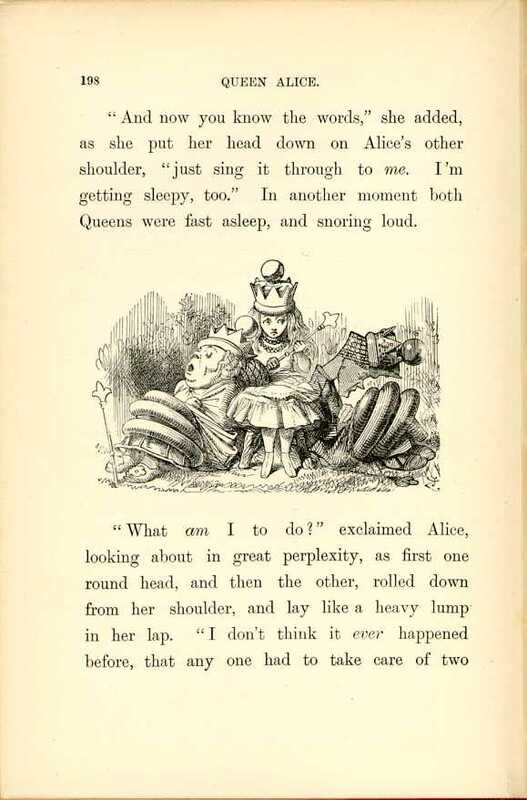 Alice wondered a little at this, but she was too much in awe of the Queen to disbelleve it. "I'll try it when I go home," she thought to herself, "the next time I'm a little late for dinner." "It's time for you to answer now," the Queen said, looking at her watch: "open your mouth a little wider when you speak, and aiways say "your Majesty.'" "I only wanted to see what the garden was like, your Majesty -- -"
"That's right," said the Queen, patting her on the head, which Alice didn't like at all: "though, when you say "garden,' I've seen gardens, compared with which this would be a wilderness." on: " -- and I thought I'd try and find my way to the top of that hill -- -"
"When you say "hill,' " the Queen interrupted, "I could show you hills, in comparison with which you'd call that a valley." 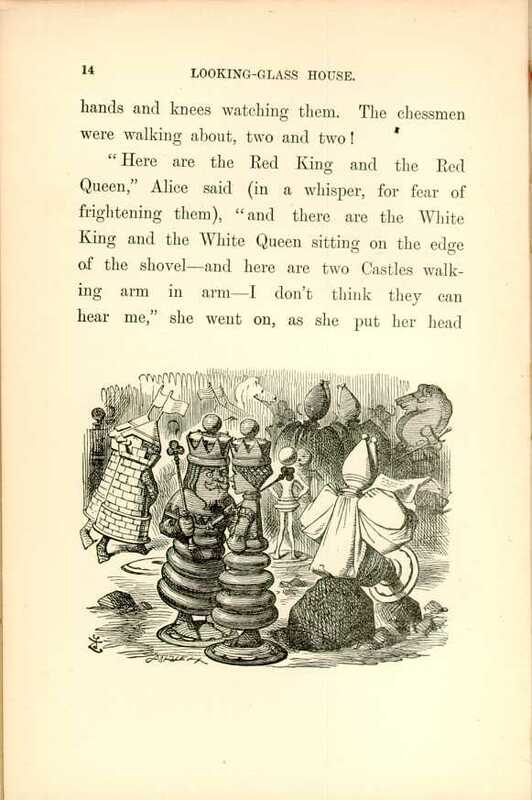 "No, I shouldn't," said Alice, surprised into contradicting her at last: "a hill can't be a valley, you know, That would be nonsense -- -"
The Red Queen shook her head. "You may call it `nonsense' if you llke," she said, "but I've heard nonsense, compared with which that would be as sensible as a dictionary!" -Alice curtseyed again, as she was afraid from the Queen's tone that she was a little offended: and they walked on in silence till they got to the top of the little hill. She glanced rather shyly at the real Queen as she said this, but her companion only smiled pleasantly, and said, "That's easily managed. You can be the White Queen's Pawn, if you like, as Lily's too young to play; and you're in the Second Square to begin with: when you get into the Eighth Square you'll be a Queen -- -" Just at this moment, somehow or other, they began to run. 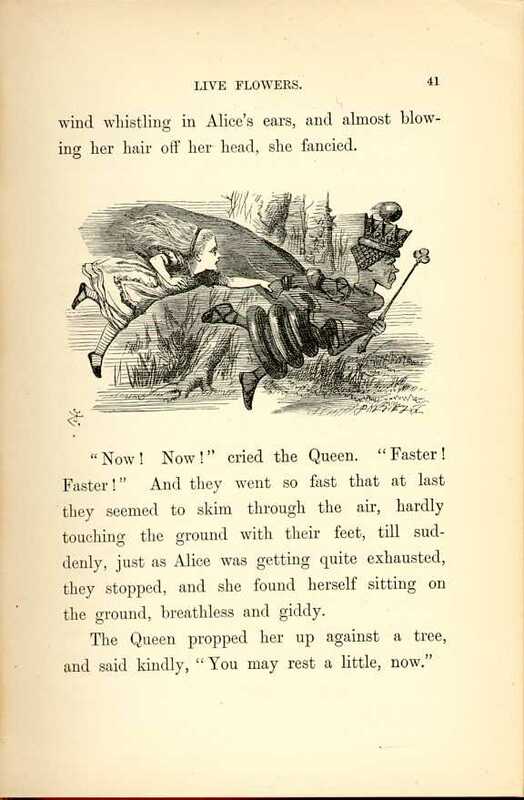 and the Queen went so fast that it was all she could do to keep up with her: and still the Queen kept crying "Faster!" but Alice felt she could not go faster, though she had no breath to say so. The most curious part of the thing was, that the trees and the other things round them never changed their places at all: however fast they went, they never seemed to pass anything. "I wonder if all the things move along with us?" thought poor puzzled Alice. And the Queen seemed to guess her thoughts, for she cried, "Faster! Don't try to talk!" Not that Alice had any idea of doing that. She felt as if she would never be able to talk again, she was getting so out of breath: and still the Queen cried, "Faster! Faster!" and dragged her along. "Are we nearly there?" Alice managed to pant out at last. quite content to stay here -- only I am so hot and thirsty! " "I know what you'd like!" the Queen said good-naturedly, taking a little box out of her pocket, "Have a biscuit?" took a ribbon out of her pocket, marked in inches, and began measuring out the ground, and sticking little pegs in here and there. "At the end of two yards," she said, putting in a peg to mark the distance, "I shall give you your directions -- have another biscuit?" Alice did not know what to say to this, but luckily the Queen did not wait for an answer, but went on. "At the end of three yards I shall repeat them -- for fear of your forgetting them. At the end of four, I shall say good-bye. And at the end of five, I shall go!" by railway, I should think -- and you'll find yourself in the Fourth Square in no time. Well, that square belongs to Tweedledum and Tweedledee -- the Fifth is mostly water -- the Sixth belongs to Humpty Dumpty -- but you make no remark?" "I -- I didn't know I had to make one -- just then " Alice faltered out. "You should have said," the Queen went on in a tone of grave reproof, " "It's extremely kind of you to tell me all this' -- however, we'll suppose it said -- the Seventh Square is all forest -- however, one of the Knights will show you the way -- and in the Eighth Square we shall be Queens together, and it's all feasting and fun!" Alice got up and curtseyed, and sat down again. At the next peg the Queen turned again, and said, "Speak in French when you can't think of the English for a thing -- turn out your toes as you walk -- and remember who you are!" She did not wait for Alice to curtsey this time, but walked on quickly to the next peg, where she turned to say "good-bye,"
and then hurried on to the last. How it happened, Allce never knew, but exactly as she came to the last peg, she was gone. Whether she vainshed into the air, or ran quickly into the wood ("and she can run very fast!" thought Alice), there was no way of guessing, but she was gone, and Alice began to remember that she was a Pawn, and that it would soon be time to move. OF course the first thing to do was make a grand survey of the country she was going to travel through. 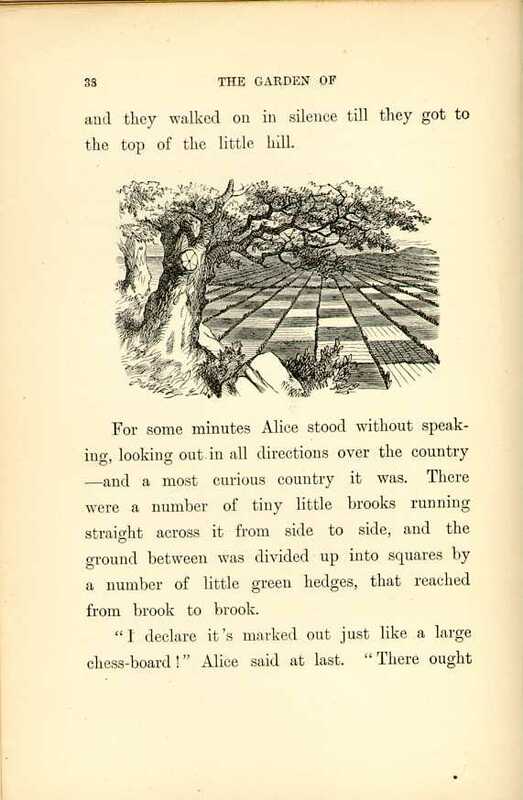 "It's something very like learning geography," thought Alice, as she stood on tiptoe in hopes of being able to see a little further. "Principal rivers -- there are none. Principal mountains -- I'm on the only one, but I don't think it's got any name. Principal towns -- why, what are those creatures, making honey down there? They can't be bees -- nobody ever saw bees a mile off you know -- -" and for some minutes she stood silent, watching one of them that was bustling about among the flowers, poking its proboscis into them, "just as if it was a regular bee," thought Alice. though the idea quite took her breath away at first. "And what enomous flowers they must be!" was her next idea. "Something like cottages with the roofs taken off, and stalks put to them -- and what quantities of honey they must make! I think I'll go down and -- no, I won't go just yet," she went on, checking herself just as she was beginning to run down the hill, and trying to find some excuse for turning shy so suddenly. "It'll never do to go down among them without a good long branch to brush them away -- and what fun it'll be when they ask me how I liked my walk. I shall say -- "Oh, I liked it well enough -- -' (here came the favourite little toss of the head), "only it was so dusty and hot, and the elephants did tease so!' "
So with this excuse she ran down the hill and jumped over the first six little brooks. "Tickets, please!" said the Guard, putting his head in at the window. In a moment everybody was holding out a ticket : they were about the same size as the people, and quite seemed to fill the carriage. "Now then! Show your ticket, child!" the Guard went on, looking angrily at Alice. And a great many voices all said together ("like the chorus of a song," thought Alice), "Don't keep him waiting, child! Why, his time is worth a thousand pounds a minute!" "I'm afraid I haven't got one," Alice said in a frightened tone : "there wasn't a ticket-office where I came from." And again the chorus of voices went on. "There wasn't room for one where she came from. The land there is worth a thousand pounds an inch!" speaking." The voices didn't join in this time, as she hadn't spoken, but, to her great surprise, they all thought in chorus (I hope you understand what thinking in chorus means -- for I must confess that I don't), "Better say nothing at all. Language is worth a thousand pounds a word!" through a telescope, then through a microscope, and then through an opera-glass. At last he said, "You're travelling the wrong way," and shut up the window and went away. A Goat, that was sitting next to the gentleman in white, shut his eyes and said in a loud voice, "She ought to know her way to the ticket-office even if she doesn't know her alphabet!" There was a Beetle sitting next the Goat (it was a very queer set of passengers altogether), and, as the rule seemed to be that they should all speak in turn, he went on with "She'll have to go back from here as luggage!" Alice couldn't see who was sitting beyond the Beetle, but a hoarse voice spoke next. '"Change engines -- -" it said, and there it choked and was obliged to leave off. 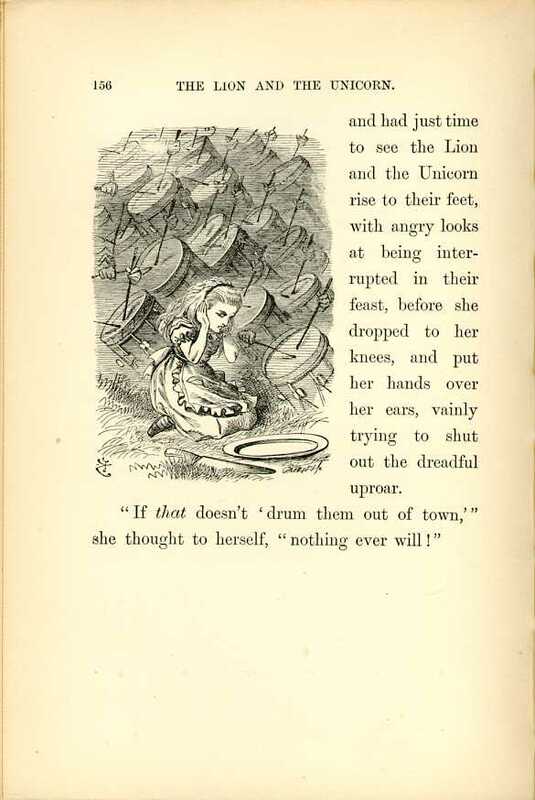 "It sounds like a horse," Alice thought to herself. And an extremely small voice, close to her ear, said, You might make a joke on that -- something about 'horse and hoarse', you know"
Then a very gentle voice in the distance said, "She must be labelled "Lass, with care,' you know -- -- "
An after that other voices went on ("What a number of people there are in the carriage!" thought Alice), saying, "She must go by post, as she's got a head on her -- -" "She must be sent as a message by the telegraph -- -" "She must draw the train herself the rest of the way -- -" and so on. "indeed I shan't!" Alice said rather impatiently. "I don't belong to this railway journey at all -- I was in a wood just now -- and I wish I could get back there!" "You might make a joke on that," said the little voice close to her ea : "something about 'you would, if you could', you know." 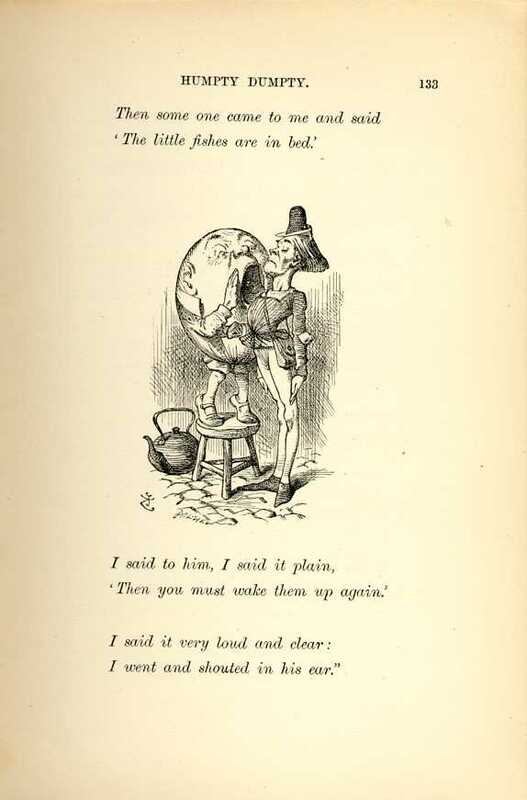 "Don't tease so," said Alice, looking about in vain to see where the voice came from ; "if you're so anxious to have a joke made, why don't you make one yourself?" "I know you are a friend," the little voice went on; "a dear friend and an old friend, And you won't hurt me, though I am an insect." everybody jumped up in alarm, Alice among the rest. The Horse, who had put his head out of the window, quietly drew it in and said, "It's only a brook we have to jump over." Everybody seemed satisfied with this, though Alice felt a little nervous at the idea of trains jumping at all. "However, it'll take us into the Fourth Square, that's some comfort!" she said to herself. In another moment she felt the carriage rise straight up into the air, and in her fright, she caught at the thing nearest to her hand, which happened to be the Goat's beard. But the beard seemed to melt away as she touched it, and she found herself sitting quietly under a tree -- while the Gnat (for that was the insect she had been talking to) was balancing itself on a twig just over her head, and fanning her with its wings.
" -- then you don't like all insects?" the Gnat went on, as quietly as if nothing had happened. "None of them ever talk, where I come from." "I don't rejoice in insects at all," Alice explained, "because I'm rather afraid of them -- at least the , large kinds. But I can tell you the names of some of them." "No use to them," said Alice; "but it's useful to the people that name them, I suppose. If not, why do things have names at all?" "I can't' say," said the Gnat. "In the wood down there, they've got no names -- however, go on with your list of insects." 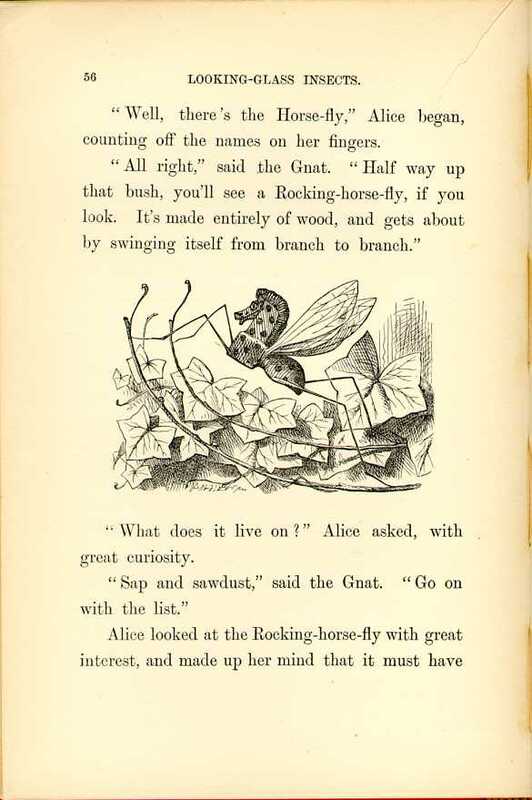 "All right," said the Gnat: "half-way up that bush, you'll see a Rocking-horse-fly, if you look. It's made entirely of wood, and gets about by swinging itself from branch to branch." Alice looked at the Rocking-horse-fly with great interest, and made up her mind that it must have been just repainted, it looked so bright and sticky ; and then she went on. "And what does it live on?" Allce asked, as before. "Frumenty and mince-pie," the Gnat replied; "and it makes its nest in a Christmas-box." 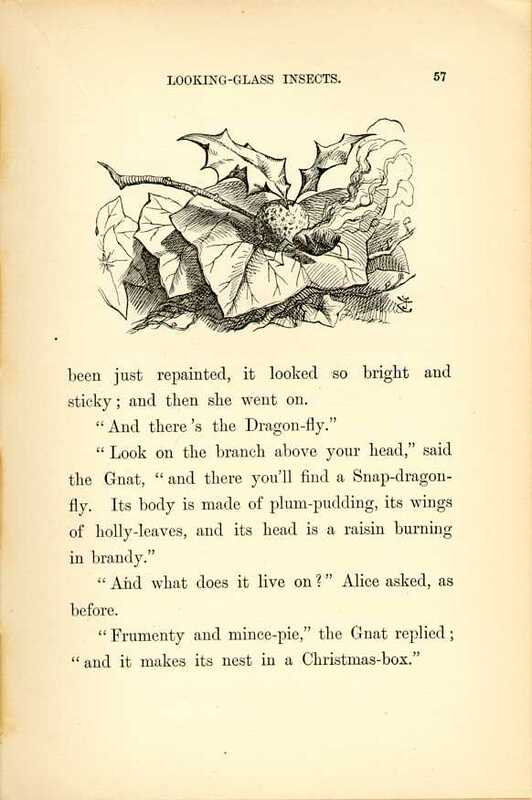 "And then there's the Butterfly," Alice went on, after she had taken a good look at the insect with its head on fire, and had thought to herself, "I wonder if that's the reason insects are so fond of flying into candles -- because they want to turn into Snap-dragon-flies!" "Crawling at your feet," said the Gnat (Alice drew her feet back in some alarm), "you may observe a Bread-and-butter-fly. Its wings are thin slices of bread-and-butter, its body is a crust, and its head is a lump of sugar." "But that must happen very often," Alice remarked thoughtfully. "It always happens," said the Gnat. "No, indeed," Alice said, a little anxious. "And yet I don't know," the Gnat went on in a careless tone: "only think how convenient it would be if you could manage to go home without it. For instance, if the governess wanted to call you to your lesson, she would call out , 'Come here -- ,' and there she would have to leave off, because there wouldn't be any name for her to call and of course you wouldn't have to go, you know." "That would never do, I'm sure," said Alice: "the governess would never think of excusing me lessons for that. If she couldn't. remember my name, she'd call me 'Miss!' as the servants do." "Well, if she said "Miss,' and didn't say anything more," the Gnat remarked, "of course you'd miss your lessons. That's a joke. I wish you had made it." Why do you wish I had made it?" Alice asked. She very soon came to an open field with a wood on the other side of it: it looked much darker than the last wood, and Alice felt a little timid about going into it. However, on second thoughts, she made up her mind to go on: "for I certainly won't go back," she thought to herself, and this was the only way to the Eighth Square. to give me another, and it would be almost certain to be an ugly one. But then the fun would be, trying to find the creature that had got my old name! That's just like the advertisements, you know, when people lose dogs -- "answers to the name of "Dash": had on a brass collar' -- just fancy calling everything you met "Alice,' till one of them answered! Only they wouldn't answer at all, if they were wise." She was rambling on in this way when she reached the wood: it looked very cool and shady. "Well, at any rate it's a great comfort," she said as she stepped under the trees, "after being so hot, to get into the -- into the -- into what?" she went on, rather surprised at not being able to think of the word. "I mean to get under the -- under the -- under this, you know!" putting her hand on the trunk of the tree. "What does it call itself? I do believe it's got no name -- why, to be sure it hasn't!" She stood silent for a minute, thinking: then she suddenly began again. "Then it really has happened, after all! And now, who am I? I will remember, if I can! I'm determined to do it!" But being detemined didn't help her much, and all she could say, after a great deal of puzzling, was, "L, I know it begins with L!" 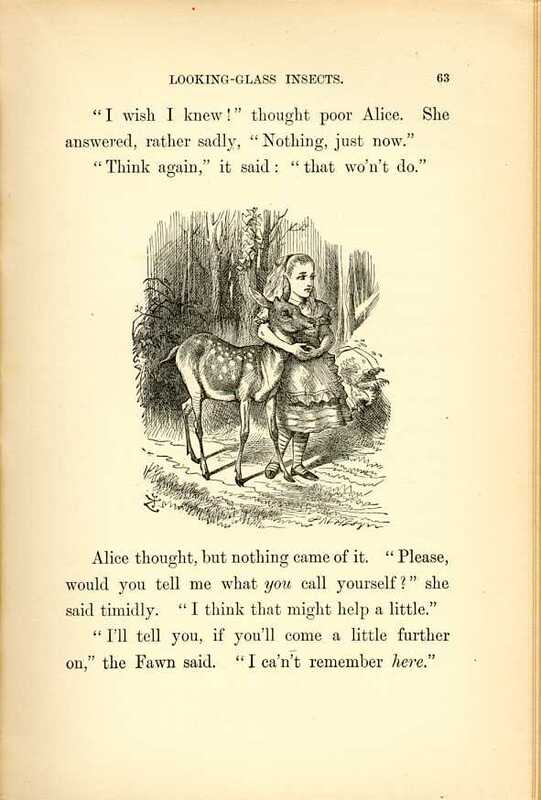 Just then a Fawn came wandering by: it looked at Alice with its large eyes, but didn't seem at all frightened. "Here then! Here then!" Alice said, as she held out her hand and tried to stroke it: but it only started back a little, and then stood looking at her again. "I wish I knew!" thought poor Alice. She answered, rather sadly; Nothing, just now." "I'll tell you, if you'll come a little further on," the Fawn said "I can't remember here." Alice with her arms clasped lovingly round the soft neck of the Fawn, till they came out into another open field, and here the Fawn gave a sudden bound into the air, and shook itself free from Alice's arms. "And, dear me, you're a human child!" A sudden look of alarm came into its beautiful brown eyes and in another moment it had darted away at full speed. now," she said: "that's some comfort. Alice -- Alice -- I won't forget it again. And now, which of these finger-posts ought I to follow, I wonder?" It was not a difficult question to answer, as there was only one road, and the finger-posts both pointed along it. "I'll settle it," Alice said to herself, "when the road divides and they point different ways. "I do believe," said Alice at last, "that they live in the same house! I wonder I never thought of that before -- but I can't stay there long. I'll just call and say "How d'ye do?' and ask them the way out of the wood. If I could only get to the Eighth square before it gets dark!" So she wandered on, talking to herself as she went, till, on turning a sharp corner, she came upon two fat little men, so suddenly that she could not help starting back, but in another moment she recovered herself, feeling sure that they must be. THEY were standing under a tree each with an arm round the other's neck, and Alice knew which was which in a moment, because one of them had "DUM' embroidered on his collar, and the other DEE.' "I suppose they've each got "TWEEDLE' round at the back of the collar," she said to herself. 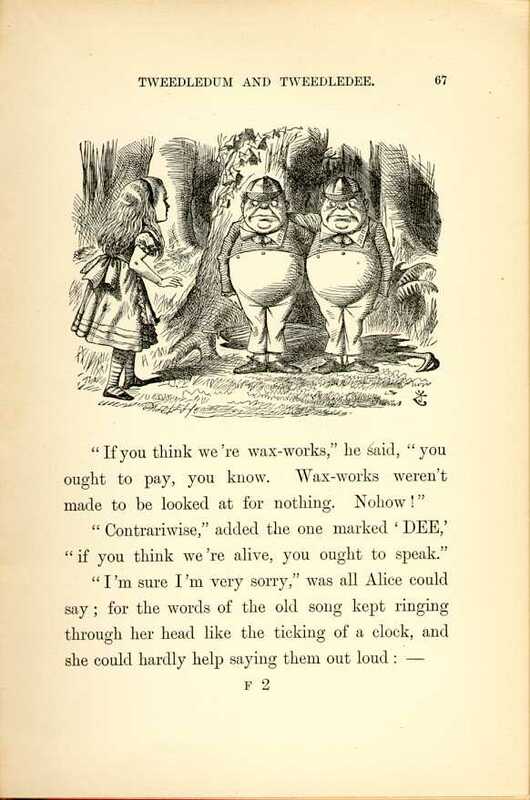 "If you think we're wax-works," he said, "you ought to pay, you know. Wax-works weren't made to be looked at for nothing. Nohow!" "Contrariwise" added the one marked 'DEE', "if you think we're alive, you ought to speak." "I know what you're thinking about," said Tweedledum : "but it isn't so, nohow." "Contrariwise," continued Tweedledee, "if it was so, it might be; and if it were so, it would be: but as it isn't, it ain't. 'That's logic." "I was thinking," Alice said very politely, "which is the best way out of this wood : it's getting so dark. Would you tell me, please ?" They looked so exactly like a couple of great schoolboys, that Alice couldn't help pointing her finger at Tweedledum, and saying, "First Boy!" "Nohow!" Tweedledum cried out briskly, and instantly shut his mouth up again with a snap. "The first thing in a visit is to say, "How d'ye do?' and shake hands!" And here the two brothers gave each other a hug, and then they held out the two hands that were free, to shake hands with her. Alice did not like shaking hands with either of them first, for fear of hurting the other one's feelings; so, as the best way out of the difficulty, she took hold of both hands at once: the next moment they were dancing round in a ring. This seemed quite natural (she remembered afterwards), and she was not even surprised to hear music playing: it seemed to come from the tree under which they were dancing, and it was done (as well as she could make it out) by the branches rubbing one across the other, like fiddles and fiddlesticks. "But it certainly was funny" (Alice said afterwards, when she was telling her sister the history of all this) "to find myself singing "Here we go round the mulberry bush.' I don't know when I began it, but somehow I felt as if I'd been singing it a long, long time!" They then let go of Alice's hands, and stood looking at her for a minute: there was a rather awkward pause, as Alice didn't know how to begin a conversation with people she had just been dancing with. "It would never do to say "How d'ye do?' now," she said to herself: "we seem to have got beyond that, somehow!" "Ye-es, pretty well -- some poetry," Alice said doubtfully. "Would you tell me which road leads out of the wood?" "The sun was shining- -- "
Here Alice ventured to interrupt. "If it's very long," she said, as politely as she could, "would you tell me first which road -- -"
"No hurry!' said the Carpenter. 'It was so kind of you to come.! 'You've had a pleasant run.! 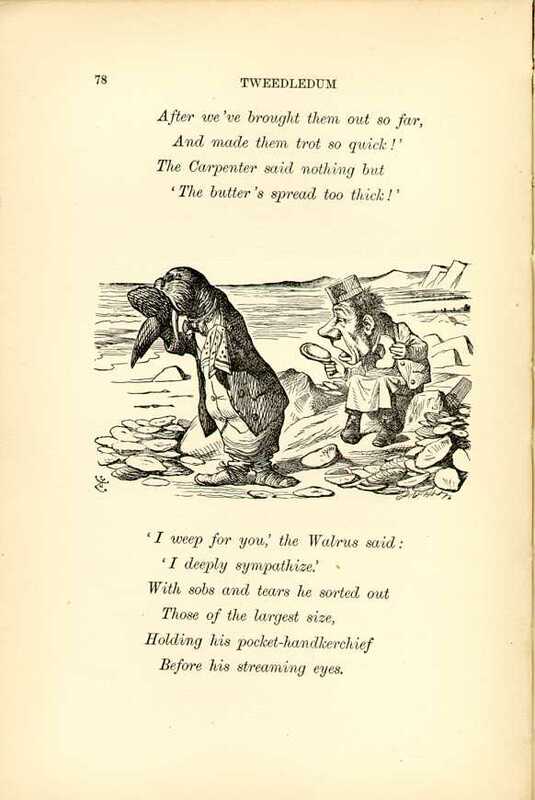 "I like the Walrus best," said Alice: "because you see he was a little story for the poor oysters." 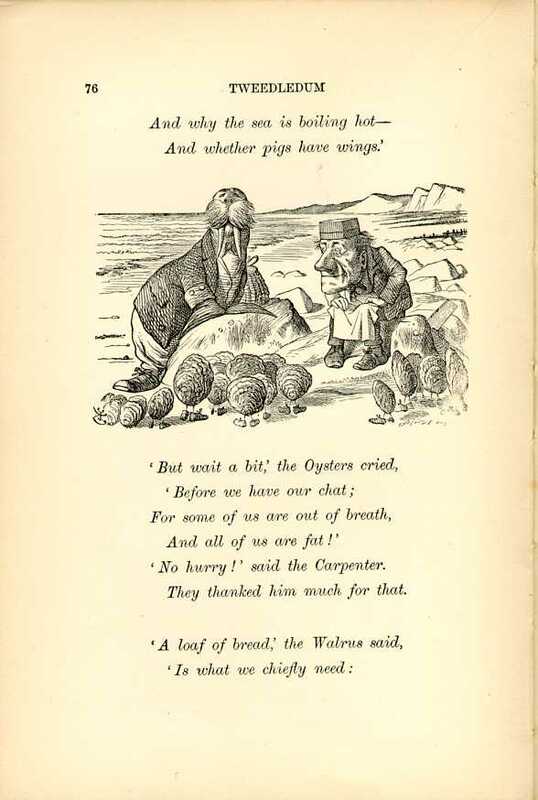 "He ate more than the Carpenter, though" said Tweedledee. "You see he held his handkerchief in front, so that the Carpenter couldn't count how many he took: contrariwise." "That was mean!" Alice said indignantly. 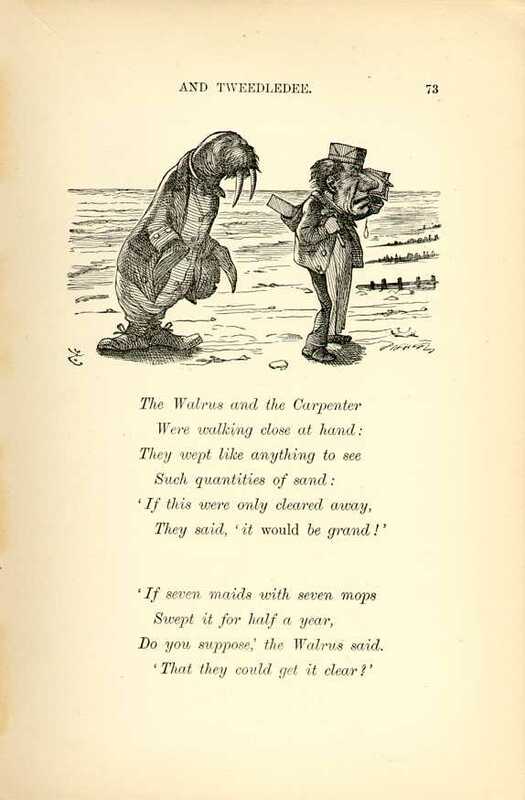 "Then I like the Carpenter best -- if he didn't eat so many as the Walrus." them, though she feared it was more likely to be a wild beast. "Are there any lions or tigers about here?" she asked timidly. 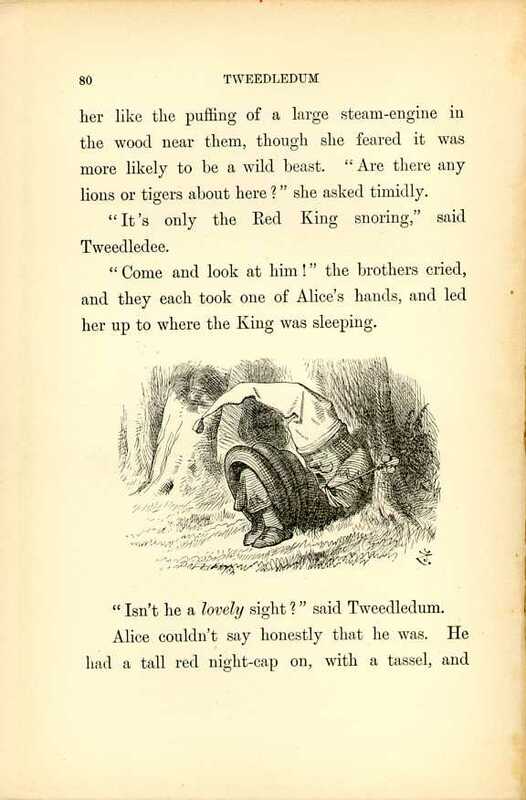 "lt's only the Red King snoring," said Tweedledee. "Isn't he a lovely sight?" said Tweedledum. Alice couldn't say honestly that he was. He had a tall red night-cap on, with a tassel, and he was lying crumpled up into a sort of untidy heap, and snoring loud -- "fit to snore his head off!" as Tweedledum remarked. dreaming about you, where do you suppose you'd be?" 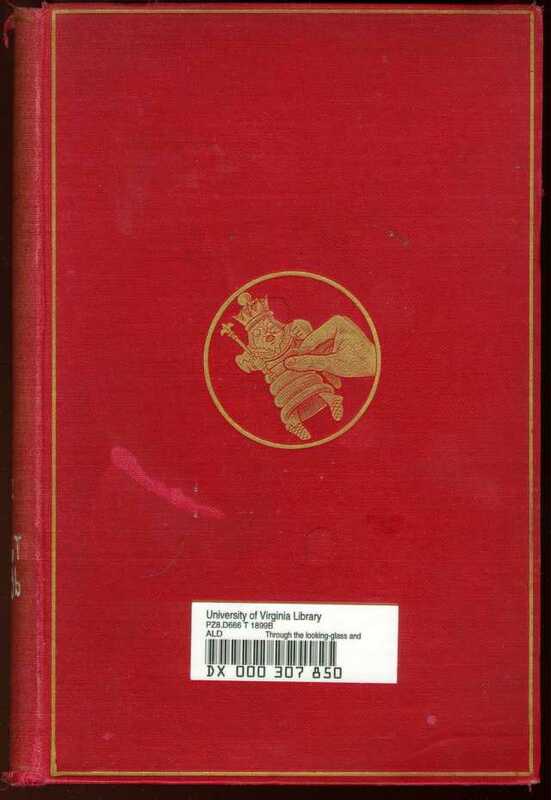 "If that there King was to wake," added Tweedledum, "you'd go out -- bang! -- just llke a candle!" are you, I should like to know?" "I am real!" said Alice, and began to cry. "You won't make yourself a bit realer by crying," Tweedledee remarked: "there's nothing to cry about." "If I wasn't real," Alice said -- half-laughing through her tears, it all seemed so ridiculous -- "I shouldn't be able to cry." of the wood, for really it's coming on very dark. Do you think it's going to rain?" Tweedledum spread a large umbrella over himself and his brother, and looked up into it. "No, I don't think it is," he said: "at least -- not under here. Nohow." "It may -- if it chooses," said Tweedledee: "we've no objection. Contrariwise." and seized her by the wrist. "Do you see that?" he said in a voice choking with passion, and his eyes grew large and yellow all in a moment, as he pointed with a trembling finger at a small white thing lying under the tree. "It's only a rattle," Alice said, after a careful examination of the little white thing. "Not a rattle-snake, you know," she added hastily, thinking that he was frightened: "only an old rattle -- quite old and broken." "But it isn't old!" Tweedledum cried, in a greater fury than ever. "It's new, I tell you -- I bought it yesterday -- my nice NEW RATTLE!" and his voice rose to a perfect scream. 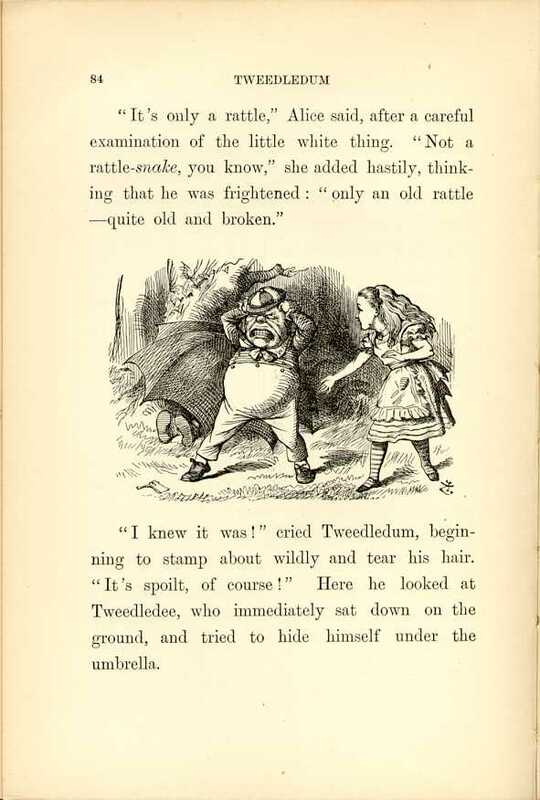 All this time Tweedledee was trying his best to fold up the umbrella, with himself in it: which was such an extraordinary thing to do, that it quite took off Alice's attention from the angry brother. But he couldn't quite succeed, and it ended in his rolling over, bundled up in the umbrella, with only his head out: and there he lay, opening and shutting his mouth and his large eyes -- "looking more like a fish than anything else," Alice thought. "I hope you're a good hand at pinning and tying strings?" Tweedledum remarked. "Every one of these things has got to go on, somehow or other." fuss made about anything in all her life -- the way those two bustled about -- and the quantity of things they put on -- and the trouble they gave her in tying strings and fastening buttons -- "Really they'll be more like bundles of old clothes than anything else, by the time they're ready!" she said to herself, as she arranged a bolster round the neck of Tweedledee, "to keep his head from being cut off," as he said. the most serious things that can possibly happen to one in a battle -- to get one's head cut off." Alice laughed loud, but managed to turn it into a cough, for fear of hurting his feelings. "Well -- yes -- a little," Alice replied gently. "And I've got a toothache!" said Tweedledee, who had overheard the remark. "I'm far worse than you!" Tweedledee looked at his watch, and said, "Half-past four." "Very well," the other said, rather sadly: "and she can watch us -- only you'd better not come very close," he added: "I generally hit everything I can see -- when I get really excited." "I wish the monstrous crow would come!" thought Alice. Alice ran a little way into the wood, and stopped under a large tree. "It can never get at me here," she thought: "it's far too large to squeeze itself in among the trees. But I wish it wouldn't flap its wings so -- it makes quite a hurricane in the wood -- here's somebody's shawl being blown away!" "Well, yes, if you call that addressing," the Queen said. "It isn't my notion of the thing, at all. Alice thought it would never do to have an argument at the very beginning of their conversation, so she smiled and said, "If your Majesty will only tell me the right way to begin, I'll do it as well as I can." It would have been all the better, as it seemed to Alice, if only she had got some one else to dress her, she was so dreadfully untidy. "Every single thing's crooked," Alice thought to herself, "and she's all over pins! -- May I put your shawl a little more straight for you?" she added aloud. "I don't know what's the matter with it!" the Queen said, in a melancholy voice. "It's out of temper, I think, I've pinned it here, and I've pinned it there, but there's no pleasing it!" on one side," Alice said, as she gently put it right for her; "and, dear me, what a state your hair is in!" "The brush has got entangled in it!" the Queen said with a deep sigh. "And I lost the comb yesterday." Alice couldn't help laughing, as she said, "I don't want you to hire me -- and I don't care for jam." "You couldn't have it if you did want it," the Queen said. "The rule is, jam to-morrow and jam yesterday -- but never jam to-day." "I don't understand you," said Alice, "It's dreadfully confusing!" kindly: "it always makes one a little giddy at first -- -"
" -- but there's one great advantage in it, that one's memory works both ways." "I'm sure mine only works one way" Alice remarked. "I can't remember things before they happen." "Oh, things that happened the week after next." the Queen replied in a careless tone. "For instance, now," she went on, sticking a large piece of plaster on her finger as she spoke, "there's the King's Messenger. He's in prison now, being punished: and the trial doesn't even begin till next Wednesday: and of course the crime comes last of all." Queen said, as she bound the plaster round her finger with a bit of ribbon. "But if you hadn't done them," the Queen said, "that wouId have been better still; better, and better, and better!" Her voice went higher with each "better," till it got quite to a squeak at last. 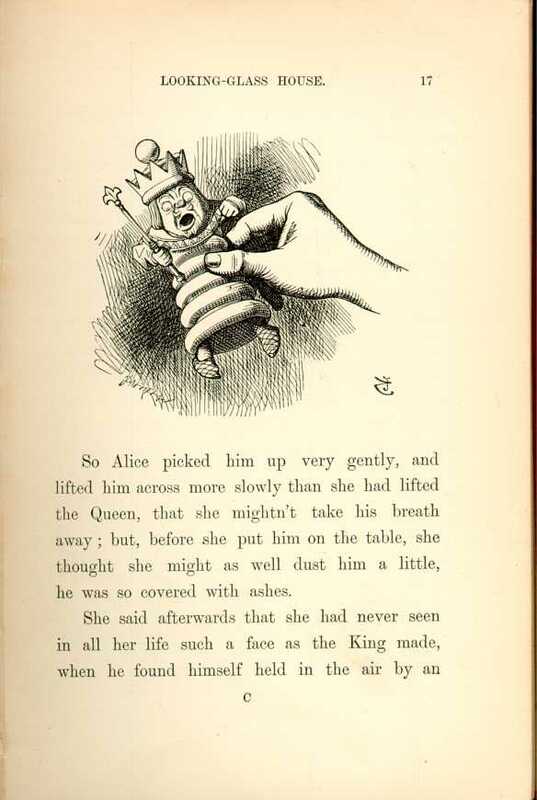 Alice was just beginning to say, "There's a mistake somewhere -- -" when the Queen began screaming, so loud that she had to leave the sentence unfinished. "Oh, oh, oh!" shouted the Queen, shaking her hand about as if she wanted to shake it off. "My finger's bleeding! Oh, oh, oh, oh!" "I haven't pricked it yet" the Queen said, "but I soon shall -- -oh, oh, oh!" "But why don't you scream now?" Alice asked, holding her hands ready to put over her ears again. "Why, I've done all the screaming already," said the Queen. "What would be the good of having it all over again?" "That's the way it's done," the Queen said with great decision: "nobody can do two things at once, you know. Let's consider your age to begin with -- how old are you?" and one, five months and a day." The brooch had come undone as she spoke, and a sudden gust of wind blew her shawl across a little brook. The Queen spread out her arms again, and went flying after it, and this time succeeded in catching it for herself. "I've got it!" she cried in a triumphant tone. "Now you shall see me pin it on again, all by myself!" "Oh, much better!" cried the Queen, her voice rising into a squeak as she went on. "Much beetter! Be-etter! Be-e-e-etter! B-e-ehh!" The last word ended in a long bleat, so like a sheep that Alice quite started. She looked at the Queen, who seemed to have suddenly wrapped herself up in wool. Alice rubbed her eyes, and looked again. She couldn't make out what had happened at all. Was she in a shop? And was that really -- was it really a sheep that was sitting on the other side of the counter? 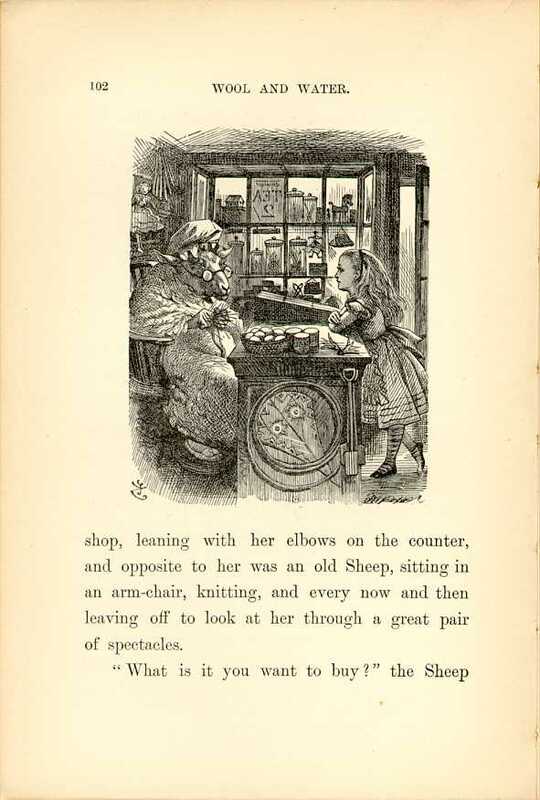 Rub as she would, she could make nothing more of it: she was in a little dark shop, leaning with her elbows on the counter, and opposite to her was an old Sheep, sitting in an arm-chair knitting, and every now and then leaving off to look at her through a great pair of spectacles. "I don't quite know yet," Alice said very gently. "I should like to look all round me first, if I might." sides, if you like," said the Sheep; "but you can't look all round you -- unless you've got eyes at the back of your head." The shop seemed to be full of all manner of curious things -- but the oddest part of it all was, that whenever she looked hard at any shelf, to make out exactly what it had on it, that particular shelf was always quite empty: though the others round it were crowded as full as they could hold. "Things flow about so here!" she said at last in a plaintive tone, after she had spent a minute or so in vainly pursuing a large bright thing, that looked sometimes like a doll and sometimes like a work-box, and was always in the shelf next above the one she was looking at. "And this one is the most provoking of all -- but I'll tell you what -- " she added, as a sudden thought struck her, "I'll follow it up to the very top shelf of all. It'll puzzle it to go through the ceiling, I expect!" make me giddy soon, if you go on turning round like that." She was now working with fourteen pairs at once, and Alice couldn't help looking at her in great astonishment. "Can you row?" the Sheep asked, handing her a pair of knitting-needles as she spoke. "Yes, a little -- but not on land -- and not with needles -- -" Alice was beginning to say when suddenly the needles turned into oars in her hands, and she found they were in a little boat, gliding along between banks: so there was nothing for it but to do her best. "Didn't you hear me say 'Feather'?" the Sheep cried angrily, taking up quite a bunch of needles. "Indeed I did," said Alice: "you've said it very often -- and very loud. Please, where are the crabs?" "In the water, of course!" said the Sheep, sticking some of the needles into her hair, as her hands were full. "Feather, I say! "Why do you say 'Feather' so often?" Alice asked at last, rather vexed. "I'm not a bird!" "You are," said the Sheep: "you're a little goose." This offended Alice a little, so there was no more conversation for a minute or two, while the boat glided gently on, sometimes among beds of weeds (which made the oars stick fast in the water, worse than ever), and sometimes under trees, but always with the same tall river banks frowning over their heads. "Oh, please! There are some scented rushes!" Alice cried in a sudden transport of delight. "There really are -- and such beauties!" "No, but I meant -- please, may we wait and pick some?" Alice pleaded. "If you don't mind stopping the boat for a minute." So the boat was left to drift down the stream as it would, till it glided gently in among the waving rushes. And then the little sleeves were carefully rolled up, and the little arms were plunged in elbow-deep, to get hold of the rushes a good long way down before breaking them off -- and for a while Alice forgot all about the Sheep and the knitting, as she bent over the side of the boat, with just the ends of her tangled hair dipping into the water -- while with bright eager eyes she caught at one bunch after another of the darling scented rushes. "I only hope the boat won't tipple over!" she said to herself. "Oh, what a lovely one! Only I couldn't quite reach it." And it certainly did seem a little provoking ("almost as if it happened on purpose," she thought) that, though she managed to pick plenty of beautiful rushes as the boat glided by, there was always a more lovely one that she couldn't reach. What mattered it to her just then that the rushes had begun to fade, and to lose all their scent and beauty from the very moment that she picked them? Even real scented rushes, you know, last only a very little while -- and these, being dreamrushes, melted away almost like snow, as they lay in heaps at her feet -- but Alice hardly noticed this, there were so many other curious things to think about. it swept her straight off the seat, and down among the heap of rushes. However, she wasn't a bit hurt, and was soon up again: the Sheep went on with her knitting all the while, just as if nothing had happened. "That was a nice crab you caught!" she remarked, as Alice got back into her place, very much relieved to find herself still in the boat. "Was it? I didn't see it," said Alice, peeping cautiously over the side of the boat into the dark water. "I wish it hadn't let go -- I should so like a little crab to take home with me!" But the Sheep only laughed scornfully, and went on with her knitting. "To buy!" 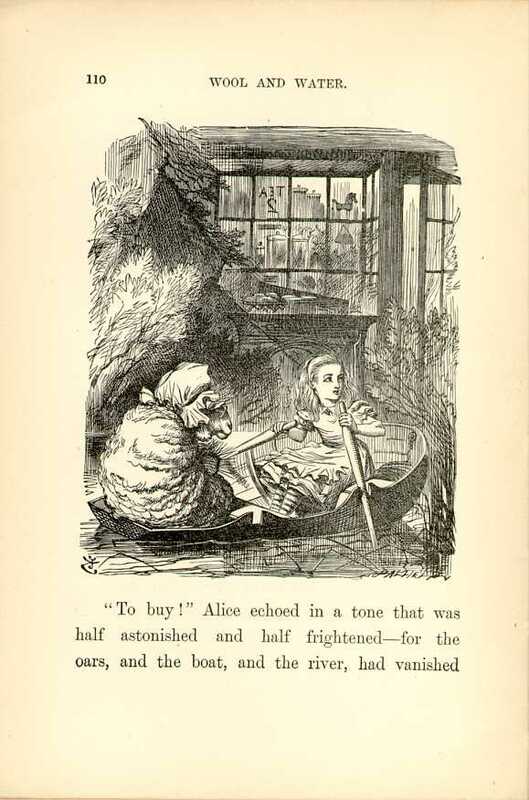 Alice echoed in a tone that was half astonished and half frightened -- for the oars, and the boat, and the river, had vanished all in a moment, and she was back again in the little dark shop. "I should like to buy an egg, please," she said timidly. "How do you sell them? "Fivepence farthing for one -- twopence for two." the Sheep replied. The Sheep took the money, and put it away in a box: then she said, "I never put things into people's hands -- that would never do -- you must get it for yourself." And so saying, she went off to the other end of the shop, and set the egg upright on a shelf. "I wonder why it wouldn't do?" thought Alice, as she groped her way among the tables and chairs, for the shop was very dark towards the end. "The egg seems to get farther away the more I walk towards it. Let me see, is this a chair? Why, it's got branches, I declare! How very odd to find trees growing here! And actually here's a little brook! Well, this is the very queerest shop I ever saw!" So she went on, wondering more and more at every step as everything turned into a tree the moment she came up to it, and she quite expected the egg to do the same. HOWEVER, the egg only got larger and larger, and more and more human: when she had come within a few yards of it, she saw that it had eyes and a nose and mouth; and when she had come close to it, she saw clearly that it was HUMPTY DUMPTY himself. "It can't be anybody else! she said to herself. "I'm as certain of it, as if his name was written all over his face!" she thought he must be a stuffed figure. 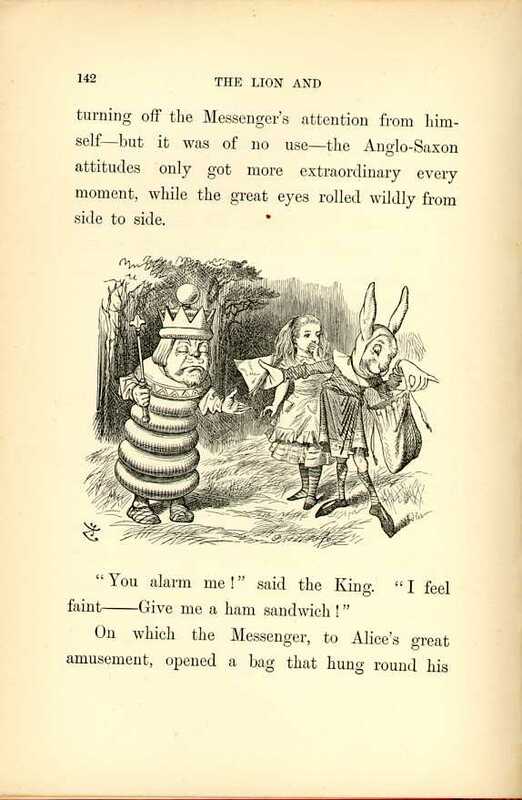 "I said you looked like an egg, Sir," Alice gently explained. "And some eggs are very pretty, you know," she added, hoping to turn her remark into a sort of compliment. "Don't stand chattering to yourself like that," Humpty Dumpty said, looking at her for the first time, "but tell me your name and your business." "My name is Alice, but -- -"
"Of course it must," Humpty Dumpty said with a short laugh: my name means the shape I am -- and a good handsome shape it is, too. With a name like yours, you might be any shape, almost." "Why do you sit out here all alone?" said"Alice, not wishing to begin an argument. the answer to that? Ask another." "What tremendously easy riddles you ask!" Humpty Dumpty growled out. "Of course I don't think so! Why, if ever I did fall off -- which there's no chance of -- but if did -- -" Here he pursed up his lips, and looked so solemn and grand that Alice could hardly help laughing. "If I did fall," he went on, the King has promised me -- ah, you may turn pale, if you like! You didn't think I was going to say that, did you? The king has promised me -- with his own mouth -- to -- to -- -- "
"Ah well! They may write such things in a book," Humpty Dumpty said in a calmer tone. "That's what you call a History of England, that is Now, take a good look at me! I'm one that has spoken to a King, I am: mayhap you'll never see such another: and to show you I'm not proud, you may shake hands with me!" And he grinned almost from ear to ear, as he leant forwards (and as nearly as possible fell off the wall in doing so) and offered Alice his hand. She watched him a little anxiously as she took it. "If he smiled much more, the ends of his mouth might meet behind," she thought: "and then I don't know what would happen to his head! I'm afraid it would come off!" "In that case we may start afresh," said Humpty Dumpty, "and it's my turn to choose a subject -- -" ("He talks about it just as if it was a game!" thought Alice.) "So here's a question for you. How old did you say you were? "Wrong!" Humpty Dumpty exclaimed triumphantly. "You never said a word like it." "I thought you meant "How old are you?'" Alice explained. "Seven years and six months!" Humpty Dumpty repeated thoughtfully. "An uncomfortable sort of age. Now if you'd asked my advice, I'd have said, "Leave off at seven' -- but it's too late now." "Too proud?" the other enquired. "I mean," she said, "that one can't help growing older." thoroughly offended, and she began to wish she hadn't chosen that subject. "If only I knew," she thought to herself, "which was neck and which was waist!" "It is a -- most -- provoking -- thing," he said at last, "when a person doesn't know a cravat from a belt!" "I know it's very ignorant of me," Alice replied in so humble a tone that Humpty Dumpty relented. "Is it really?" said Alice, quite pleased to find she had chosen a good subject, after all. thoughtfully, as he crossed one knee over the other and clasped his hands round it, " -- for an un-birthday present." "A present given when it isn't your birthday, of course. see that done on paper," he said. Humpty Dumpty took the book, and looked at it very carefully. "That seems to be done right -- -" he began. "To be sure I was!" Humpty Dumpty said gaily, as she turned it round for him. "I thought it looked a little queer. As I was saying, that seems to be done right -- though I haven't time to look it over thoroughly just now -- and that shows that there are three hundred and sixty-four days when you get un-birthday presents -- -"
"And only one for birthday presents, you know, There's glory for you!" "I don't know what you mean by 'glory,' "Alice said. Humpty Dumpty smiled contemptuously. "Of course you don't -- till I tell you. I meant "there's a nice knock-down argument for you!'" "But `glory' doesn't mean `a nice knock-down argument,'" Alice objected. "When I use a word," Humpty Dumpty said in a rather a scornful tone, "it means just what I choose it to mean -- neither more nor less. "They've a temper, some of them -- particularly verbs, they're the proudest -- adjectives you can do anything with, but not verbs -- however, I can manage the whole lot! Impenetrability! That's what I say!" 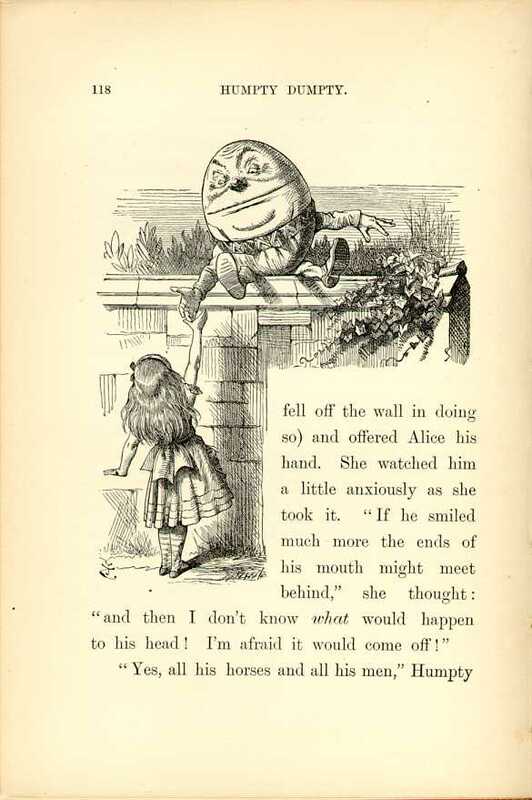 "Now you talk like a reasonable child," said Humpty Dumpty, looking very much pleased. "I meant by "impenetrability' that we've had enough of that subject, and it would be just as well if you'd mention what you meant to do next, as I suppose you don't intend to stop here all the rest of your life." "You seem very clever at explaining words, Sir," said Alice. 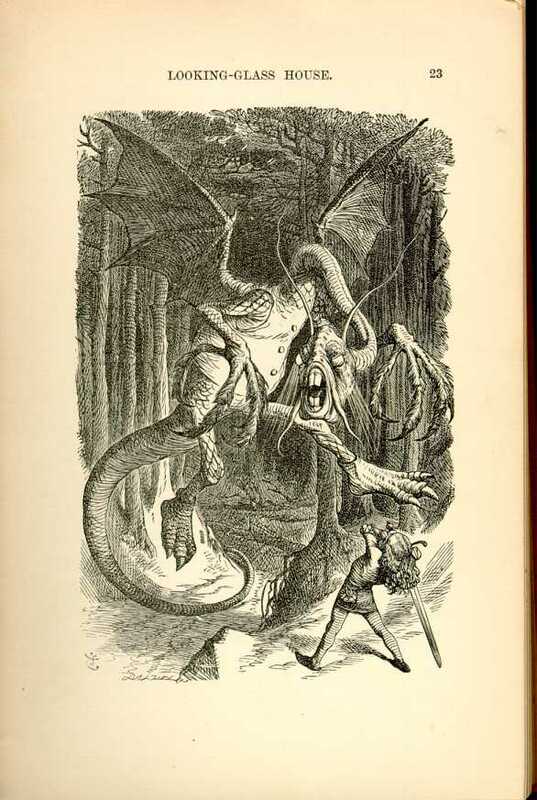 "Would you kindly tell me the meaning of the poem called `Jabberwocky' ?" "That's enough to begin with," Humpty Dumpty interrupted: "there are plenty of hard words there, `Brillig' means four o'clock in the afternoon -- the time when you begin broiling things for dinner." "Well, 'slithy' means `lithe and slimy.' `Lithe' is the same as `active.' You see it's like a portmanteau -- there are two meanings packed up into one word." 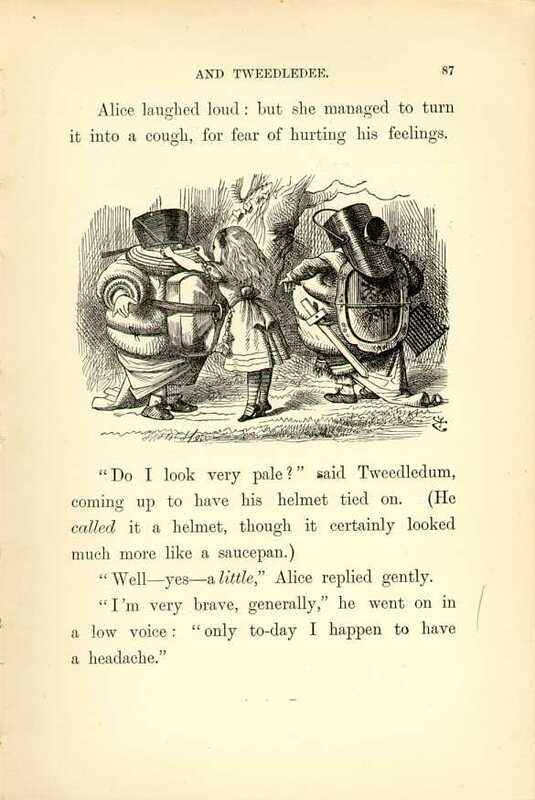 "I see it now," Alice remarked thoughtfully: "and what are toves ? they're something like lizards -- and they're something like corkscrews." "They must be very curious creatures." they make their nests under sun-dials -- also they live on cheese." "And what's to "gyre' and to "gymble'?" "To "gyre' is to go round and round like a gyroscope. To "gimble' is to make holes like a gimlet." "And "the wabe' is the grass plot round a sundial, I suppose?" said Alice, surprised at her own ingenuity. "Of course it is. It's called "wabe,' you know because it goes a long way before it, and a long way behind it -- -"
"Exactly so. Well, the "mimsy' is "flimsy and miserable' (there's another portmanteau for you). 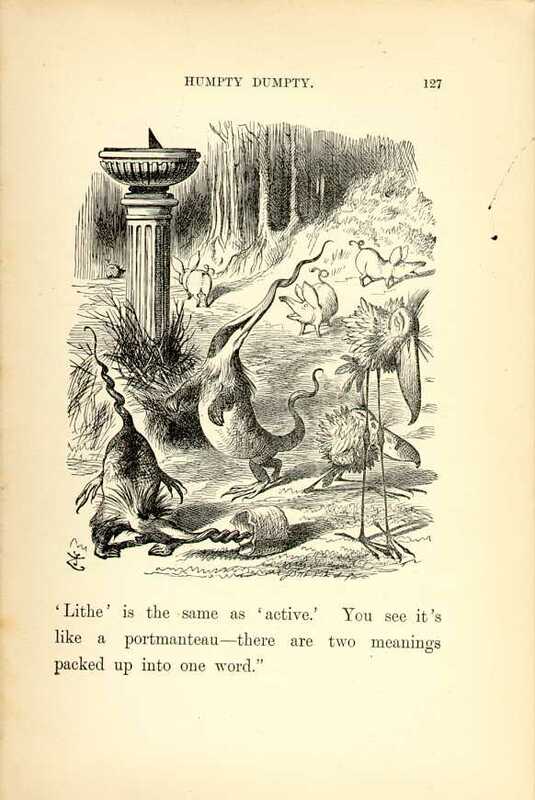 And a "borogove' is a thin shabby-looking bird with its feathers sticking out all round -- something like a live mop." "And then "mome raths' ?" said Alice. "If I'm not giving you too much trouble." "Well, 'outgribing' is something between bellowing and whistling, with a kind of sneeze in the middle: however, you'll hear it done, maybe -- down in the wood yonder -- and when you've once heard it you'll be quite content. Who's been repeating all that hard stuff to you?" "I read it in a book," said Alice. "But I had some poetry repeated to me, much easier than that, by -- Tweedledee, I think." "As to poetry, you know," said Humpty Dumpty, stretching out one of his great hands, "I can repeat poetry as well as other folk if it comes to that -- -"
only I don't sing it," he explained. 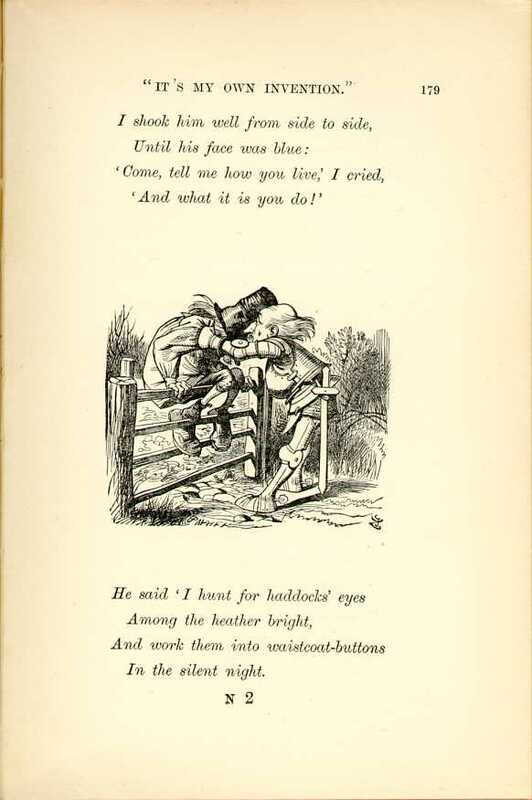 "If you can see whether I'm singing or not, you've sharper eyes than most," Humpty Dumpty remarked severely. Alice was silent. I'll try and tell you what I'mean." Take pen and ink and write it down,"
'We cannot do it, Sir, because -- -'"
"I'm afraid I don't quite understand," said Alice. "It gets easier further on," Humpty Dumpty replied. I took a corkscrew from the shelf. I tried to turn the handle, but -- -"
"That's all," said Humpty Dumpty. "Goodbye." This was rather sudden, Alice thought: but, after such a very strong hint that she ought to be going, she felt that it would hardly be civil to stay. So she held out her hand. "Good-bye, till we meet again!" she said as cheerfully as she could. "I shouldn't know you again if we did meet," Humpty Dumpty replied in a discontented tone, giving her one of his fingers to shake; "you're so exactly like other people. has -- the two eyes, so -- -" (marking their places in the air with his thumb) "nose in the middle, mouth under. It's always the same. Now if you had the two eyes on the same side of the nose, for instance -- or the mouth at the top -- -that would be some help." 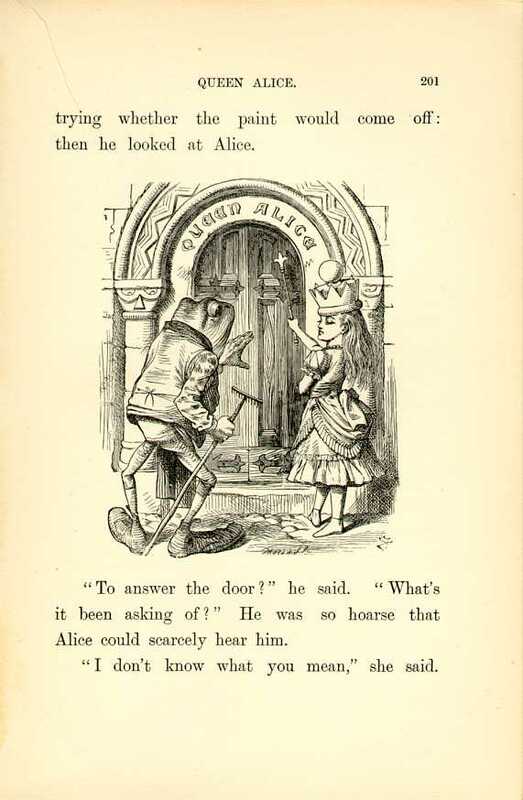 Alice waited a minute to see if he would speak again, but as he never opened his eyes or took any further notice of her, she said, "Good-bye!" once more, and, on getting no answer to this, she quietly walked away: but she couldn't help saying to herself as she went, "Of all the unsatisfactory -- -" (she repeated this aloud, as it was a great comfort to have such a long word to say) "of all the unsatisfactory people I ever met -- -" She never finished the sentence, for at this moment a heavy crash shook the forest from end to end. 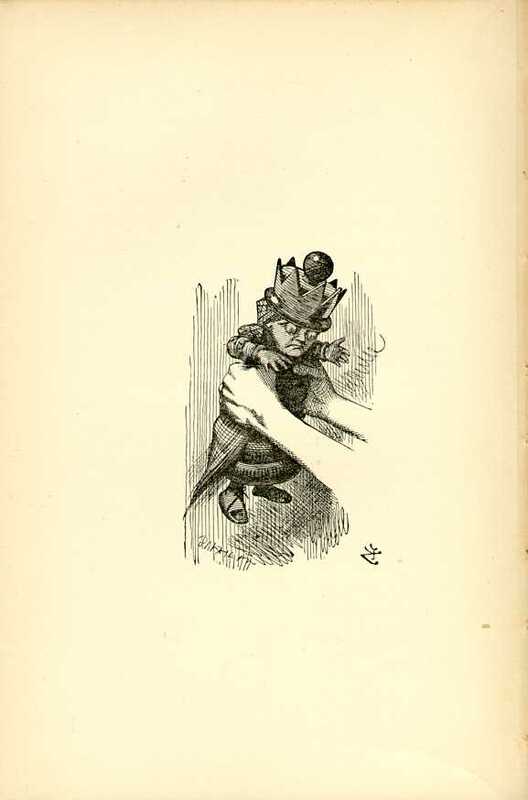 every moment, and Alice was very glad to get into an open place, where she found the White King seated on the ground, busily writing in his memorandum-book. "Four thousand two hundred and seven, that's the exact number," the King said, referring to his book. "I couldn't send all the horses, you know, because two of them are wanted in the game. And I haven't sent the two Messengers, either. They've both gone to the town. Just look along the road, and tell me if you can see either of them." "I love my love wih an H," Alice couldn't help beginning, "because he is Happy. I hate him with an H, because he is Hideous. I fed him with -- with -- with Ham-sandwiches and Hay. His name is Haigha, and he lives -- -"
"Don't I tell you?" the King repeated impatiently. "I must have two -- to fetch and carry. One to fetch, and one to carry." more extraordinary every moment, while the great eyes rolled wildly from side to side. "You alarm me!" said the King. "I feel faint -- give me a ham sandwich!" "Hay, then," the King faintly murmured. "I should think throwing cold water over you would be better," Alice suggested : " -- -or some sal-volatile." on, holding out his hand to the Messenger for some more hay. "Quite right," said the King: "this young lady saw him too. So of course Nobody walks slower than you. "I do my best," the Messenger said in a sullen tone. "I'm sure nobody walks much faster than I do!" "I'll whisper it," said the Messenger, putting his hands to his mouth in the shape of a trumpet and stooping so as to get close to the King's ear. Alice was sorry for this, as she wanted to hear the news too. However, instead of whispering, he simply shouted at the top of his voice. "They're at it again!" "Do you call that a whisper!" cried the poor King, jumping up and shaking himself. "If you do such a thing again I'll have you buttered! It went through and through my head like an earthquake!" "Why the Lion and the Unicorn of course,"
"Does -- the one -- that wins -- get the crown?" she asked, as well as she could, for the long run was putting her quite out of breath. "Would you -- be good enough -- -" Alice panted out, after running a little further, "to stop a minute -- just to get -- one's breath again?" They placed themselves close to where Hatta, the other Messenger, was standing watching the fight, with a cup of tea in one hand and a piece of bread and butter in the other. thirsty. How are you, dear child?" he went on, putting his arm affectionately round Hatta's neck. Hatta looked round and nodded, and went on with his bread-and-butter. "Speak, won't you!" cried the King. "How are they getting on with the fight?" There was a pause in the fight just then, and the Lion and the Unicorn sat down, panting, while the King called out "Ten minutes allowed for refreshments!" Haigha and Hatta set to work at once, carrying round trays of white and brown bread. Alice took a piece to taste, but it was very dry. "I don't think they'll fight any more to-day," the King said to Hatta: "go and order the drums to begin." And Hatta went bounding away like a "grasshopper. watching him. suddenly she brightened up look, look!" she cried, pointing eagerly. "There's the White Queen running across the country! She came flying out of the wood over yonder -- how fast those Queens can run!" "No use, no use!" said the King. "She runs so fearfully quick. You might as well try to catch a Bandersnatch! But I'll make a memorandum about her, if you like -- she's a dear good creature," he repeated softly to himself, as he opened his memorandum-book. "Do you spell "creature' with a double 'e'?" At this moment the Unicorn sauntered by them, with his hands in his pockets. "I had the best of it this time!" he said to the King, just glancing at him as he passed. "A little -- a little," the King replied, rather nervously. "You shouldn't have run him through with your horn, you know." "It didn't hurt him" the Unicorn said carelessly, and he was going on, when his eye happened to fall upon Alice : he turned round instantly, and stood for some time looking at her with an air of the deepest disgust. "What -- is -- this?" he said at last. The unicorn looked dreamily at Alice, and said, child." "Well, now that we have seen each other: said The Unicorn,"if you'll believe in me, I'll believe in you. Is that a bargain? "Come, fetch out the plum-cake, old man!" the Unicorn went on, turning from her to the King. "None of your brown bread for me!" "Certainly Certainly!" the king muttered, and beckoned to Haigha. "Open the bag!" he whispered. "Quick! Not that one -- that's full of hay!" carving-knife. How they all came out of it Alice couldn't guess. It was just like a conjuring trick, she thought. The Lion had joined them while this was going on: he looked very tired and sleepy, and his eyes were half shut. "What's this?" he said, blinking lazily at Alice, and speaking in a deep hollow tone that sounded like the tolling of a great bell. "Ah, what is it, now ?" the Unicorn cried eagerly, "You'll never guess! I couldn't." 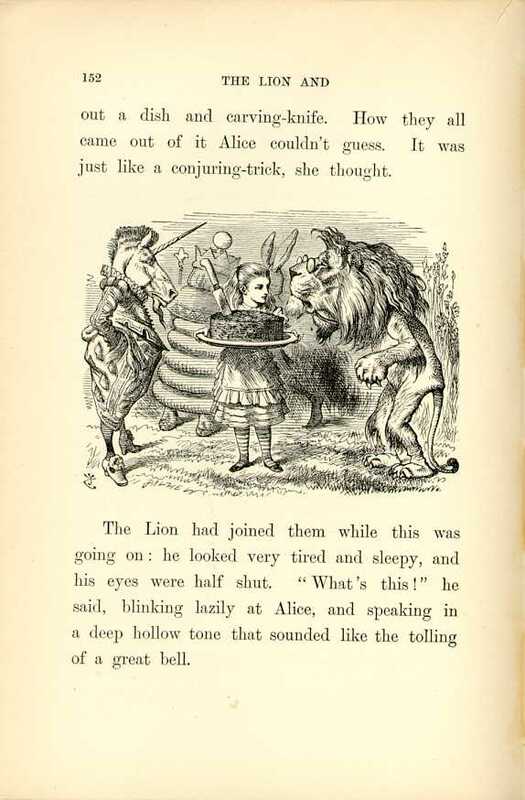 The Lion looked at Alice wearily. "Are you animal -- -or vegetable -- or mineral?" he said, yawning at every other word. "Then hand round the plum-cake, Monster," the Lion said, lying down and putting his chin on his paws. 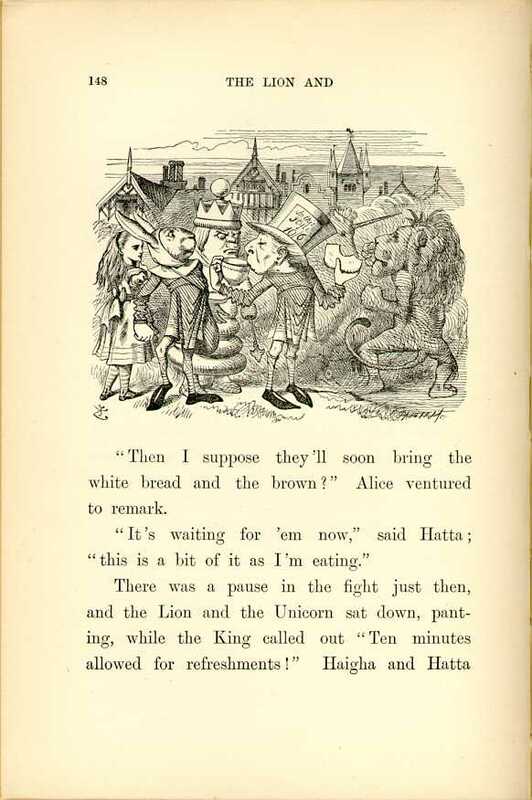 "And sit down, both of you" (to the King and the Unicorn) : "fair play with the cake, you know!" The king was evidently very uncomfortable at having to sit down between the two great creatures ; but there was no other place for him. "What a fight we might have for the crown, now!" the Unicorn said, looking slyly up at the crown, which the poor King was nearly shakin off his head, he trembled so much. Here the king interupted, to prevent the quarrel going on: he was very nervous, and his voice quite quivered. "Ali round the town?" he said. "That's a good long way. Did you go by the old bridge, or the market-place? You get the best view by the old bridge as he lay down again. "There was too much dust to see anything. What a time the Monster is, cutting up that cake!" cake divided itself into three pieces as she did so. "Now cut it up," said the Lion, as she returned to her place with the empty dish. "I say, this isn't fair!" cried the Uincorn, as Alice sat with the knife in her hand, very much puzzled how to begin. "The Monster has given the Lion twice as much as me!" But before Alice could answer him the drums began. Where the noise came from she couldn't make out: the air seemed full of it, and it rang through She started to her feet, and sprang across the little brook in her terror, and had just time to see the Lion and the Unicorn rise to their feet, with angry looks at being interrupted in their feast, before she dropped to her knees and put her hands over her ears, vainly trying to shut out the dreadful uproar. "If that doesn't "drum them out of town,' " she thought to herself, "nothing ever will!" AFTER a while the noise seemed gradually to die away, till all was dead silence, and Alice lifted up her head in some alarm. There was no one to be seen, and her first thought was that she must have been dreaming about the Lion and the Unicorn and those queer Anglo-Saxon Messengers, however, there was the great dish still lying at her feet, on which she had tried to cut the plum-cake' "So I wasn't dreaming, after all." she said to herself, "unless -- unless we're all part of the same dream. Only I do hope it's my dream and not the Red King's! I don't like belonging to another person's dream," she went on in a rather complaining tone: "I've a great mind to go and wake him, and see what happens!" At this moment her thoughts were interrupted by a loud shouting of "Ahoy! Ahoy! Check!" 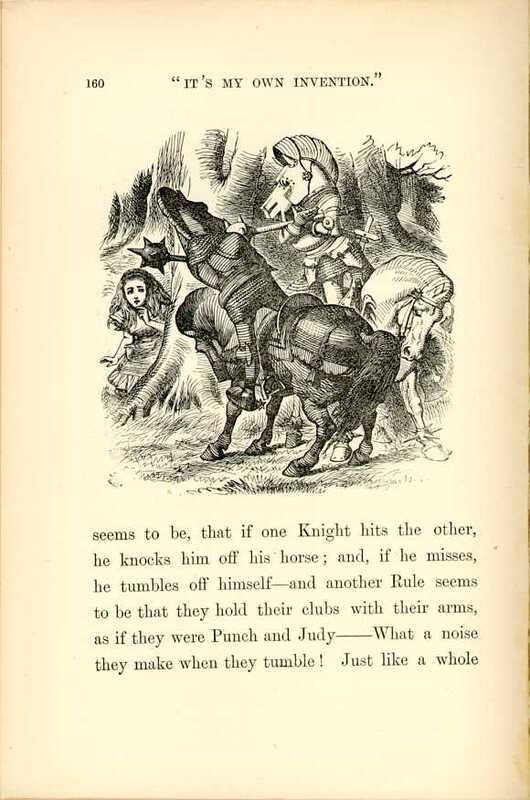 and a Knight, dressed in crimson armour, came galloping down upon her, brandishing a great club. just as he reached her, the horse stopped suddenly: "You're my prisoner!" the Knight cried, as he tumbled off his horse. Startled as she was, Alice was more frightened for him than for herself at the moment, and watched him with some anxiety as he mounted again. As soon as he was comfortably in the saddle, he began once more, "You're my -- -" but here another voice broke in, "Ahoy! Ahoy! Check!" and Alice looked round in some surprise for the new enemy. This time it was a White Knight. He drew up at Alice's side, and tumbled off his horse just as the Red Knight had done: then he got on again, and the two Knights sat and looked at each other without speaking. Alice looked from one to the other in some bewilderment. "She's my prisoner, you know!" the Red-Knight said at last. 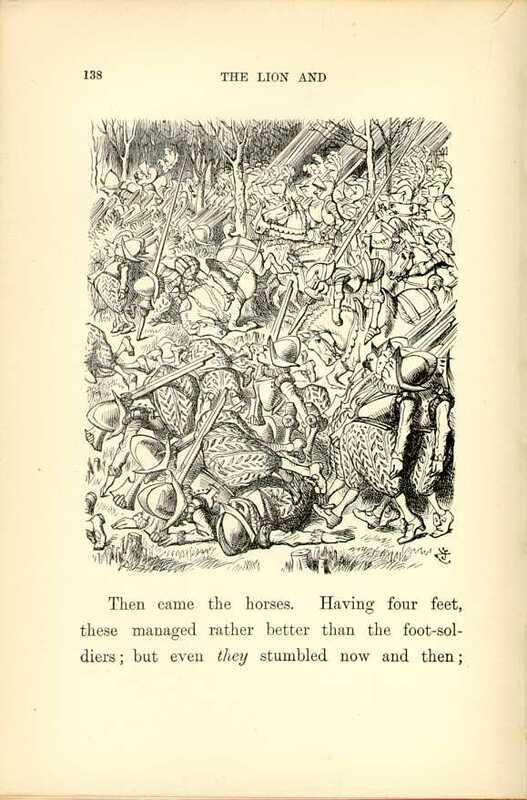 "I wonder, now, what the Rules of Battle are," she said to herself, as she watched the fight, timidly peeping out from her hiding-place: "one Rule seems to be that, if one Knight hits the other, he knocks him off his horse, and if he misses, he tumbles off-himself -- and another Rule seems to be that they hold their clubs in their arms, as if they were Punch and Judy. What a noise they make when they tumble! Just like fire-irons falling into the fender! And how quiet the horses are! They let them get on and off them just as if they were tables!" "I don't know," Alice said doubtfully. "I don't want to be anybody's prisoner. I want to be Queen." "So you will, when you've crossed the next brook," said the White Knight. "I'll see you safe to the end of the wood -- and then I must go back, you know. That's the end of my move." "Thank you very much," said Alice. "May I help you off with your helmet?" It was evidently more than he could manage by himself; however she managed to shake him out of it at last. fastened across his shoulders upside-down, and with the lid hanging open. Alice looked at it with great curiosity. "I see you're admiring my little box," the Knight said in a friendly tone. "It's my own invention -- to keep clothes and sandwiches in. You see I carry it upside-down, so that the rain can't get in." "I didn't know it," the Knight said, a shade of vexation passing over his face. "Then all the things must have fallen out! And the box is no use without them." He unfastened it as he spoke, and was just going to throw it into the bushes, when a sudden thought seemed to strike , and he hung it carefully on a tree. "Can you guess why I did that!" he said to Alice. Alice shook her head. "In hopes some bees may make a nest in it -- then I should get the honey." "But you've got a bee-hive -- or something like one -- fastened to the saddle," said Alice. "Yes, it's a very good bee-hive," the Knight said in a discontented tone, "one of the best kind. But not a single bee has come near it yet. And the other thing is a mouse-trap. I suppose the mice keep the bees out -- or the bees keep the mice out, I don't know which." "Not very likely, perhaps," said the Knight; "but if they do come, I don't choose to have them running all about." "You see," he went on after a pause, "it's as well to be provided for everything. That's the reason the horse has anklets round his feet." "To guard against the bites of sharks," the Knight replied. "It's an invention of my own. And now help me on. I'll go with you to the end of the wood -- what's that dish for?" "We'd better take it with us," the Knight said. "It'll come in handy if we find any plum-cake. Help me to get it into this bag." This took a long time to manage, though Alice held the bag open very carefully, because the Knight was so very awkward in putting in the dish: the first two or three times that he tried he fell in himself instead. "It's rather a tight fit, you see," he said, as they got it in at last; "there are so many candlesticks in the bag." And he hung it to the saddle, which was already loaded with bunches of carrots, and fire-irons, and many other things. "I hope you've got you hair well fastened on?" he continued, as they set off. "Have you invented a plan for keeping one's hair from being blown off?" Alice enquired. "I should like to hear it very much." Knight. "Then you make your hair creep up it, Like a fruit-tree. Now the reason hair falls off is because it hangs down -- things never fall upwards, you know. It's my own invention. You may try it if you like." thought, and for a few minutes she walked on in silence, puzzling over the idea, and every now and then stopping to help the poor Knight, who certainly was not a good rider. The Knight looked very much surprised, and a little offended at the remark. "What makes you say that?" 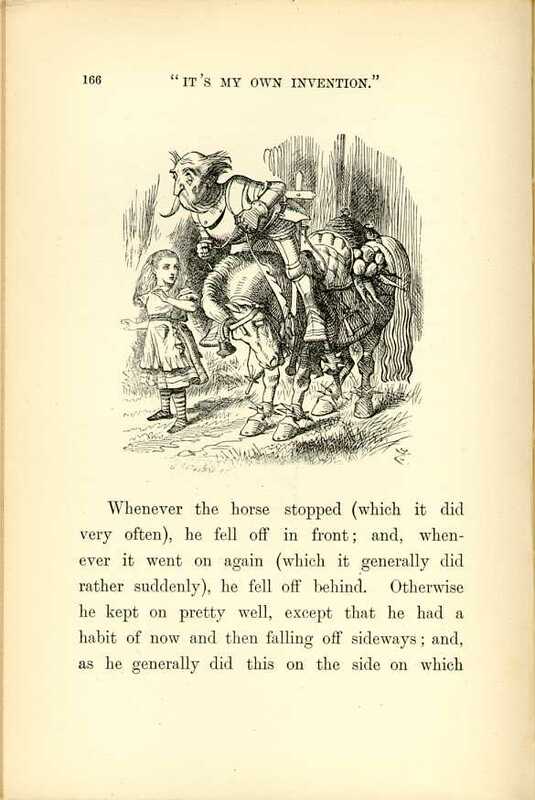 he asked, as he scrambled back into the saddle, keeping hold of Alice's hair with one hand, to save himself from falling over on the other side "Because people don't fall off quite so often, when they've had much practice." "The great art of riding," the Knight suddenly began in a loud voice, waving his right arm as he spoke "is to keep -- " Here the sentence ended as suddenly as it had begun, as the Knight fell heavily on the top of his head exactly in the path where Alice was walking. She was quite frightened this time, and said in an anxious tone, as she picked him up, "I hope no bones are broken?" "None to speak of," the Knight said, as if he didn't mind breaking two or three of them. "The great art of riding as I was sayin is -- to keep your balance. Like this, you know -- -"
he fell flat on his back, right under the horse's feet. "It's too ridiculous!" cried Alice, getting quite out of patience. "You ought to have a wooden horse on wheels, that you ought!" "Does that kind go smoothly?" the Knight asked in a tone of great interest, clasping his arms round the horses' neck as he spoke, just in time to save himself from tumbling off again. "I'll get one," the Knight said thoughtfully to himself. "One or two -- several." There was a short silence after this; then the night went on again. "I'm a great hand at inventing things. Now, I daresay you noticed, the last time you picked me up, that I was looking thoughtful?" getting over a gate -- would you like to hear it?" "I'll tell you how I came to think of it," said the Knight. "You see, I said to myself, "The only diffculty is with the feet: the head is high enough already.' Now, first I put my head on the top of the gate -- then the head's high enough -- then I stand on my head -- then the feet are high enough, you see -- then I'm over you see." "I haven't tried it yet," the Knight said, gravely, "so I can't tell for certain -- but I'm afraid it would be a little hard." it always touched the ground directly. So I had very little way to fall, you see -- but there was the danger of falling into it, to be sure. That happened to me once -- and the worst of it was, before I could get out again, the other White Knight came and put it on. He thought it was his own helmet." "I had to kick him, of course," the Knight said very seriously. "And then he took the helmet off again -- but it took hours and hours to get me out. I was as fast as -- as lightning, you know." "But that's a different kind of fastness," Alice objected. Alice ran to the side of the ditch to look for him. She was rather startled by the fall, as for some time he had kept on very well, and she was afraid that he really was hurt this time. However, though she could see nothing but the soles of his feet, she was he was talking on in his usual tone. "All kinds of fastness," he repeated: "but it was careless of him to put another man's helmet on -- with the man in it, too." by the feet, and laid him in a heap on the bank. The Knight looked surprised at the question. "What does it matter where my body happens to be?" he said. "My mind goes on working all the same. In fact, the more head-downwards I am, the more I keep inventing new things." "Now the cleverest thing that I ever did," he went on after a pause, "was inventing a new pudding during the meat-course." "In time to have it cooked for the next course?" said Alice. "Well, that was quick work, certainly." "Well, not the next course," the Knight said in a slow thoughtful tone: "no, certainly not the next course." "Then it would have, to be the next day. I suppose you wouldn't have two pudding-courses in one dinner?" cooked! In fact, I don't believe that pudding ever will be cooked! And yet it was a very clever pudding to invent." "What did you mean it to be made of?" Alice asked, hoping to cheer him up, for he seemed quite low-spirited about it. "It began with blotting-paper," the Knight answered with a groan. "That wouldn't be very nice, I'm afraid -- -"
"Not very nice alone," he interrupted, quite eagerly: "but you've no idea what a difference it makes, mixing it with other things -- such as gunpowder and sealing-wax. And here I must leave you." Alice could only look puzzled: she was thinking of the pudding. beautiful. Everybody that hears me sing it -- either it brings the tears into their eyes, or else -- -"
"Or else it doesn't, you know. The name of the song is called 'Haddocks' Eyes.' "
"No, you don't understand," the Kinght said, looking a little vexed. "That's what the name is called. The name really is 'The Aged Aged Man.'" "Then I ought to have said, 'That's what the song is called'?" Alice corrected herself. "No, you oughtn't: that's another thing. The song is called 'Ways and Means': but that's only what it's called, you know!" "I was coming to that," the Knight said. "The song really is 'A sitting on a Gate': and the tune's my own invention." hand, and with a faint smile lighting up his gentle, foolish face, he began. Of all the strange things that Alice saw in her journey Through the Looking-glass, this was the one that she always remembered most clearly. Years afterwards she could bring the whole scene back again, as if it had been only yesterday -- the mild blue eyes and kindly smile of the Knight -- the setting sun gleaming through his hair, and shining on his armour in a blaze of light that quite dazzled her -- the horse quietly moving about, with the reins hanging loose on his neck, cropping the grass at her feet -- and the black shadows of the forest behind -- all this she took in like a picture, as, with one hand shading her eyes, she leant against a tree, watching the strange pair, and listening, in a half-dream, to the melancholy music of the song. "But the tune isn't his own invention," she said to herself: "it's "I give thee all, I can no more.'" She stood and listened very attentively, but no tears came into her eyes. A sitting on a gate"
As the Knight sang the last words of the ballad he gathered up the reins, and turned his horse's head along the road by which they had come. "You've only a few yards to go," he said, "down the hill and over that little brook and then you'll be a Queen -- but you'll stay and see me off first?" he added as Alice turned away with an eager look. "I shan't be long. You'll wait and wave your handkerchief when I get to that turn in the road? I think it'll encourage me, you see." very much for coming so far -- and for the song -- I liked it very much." "I hope so," the Knight said doubtfully: "but you didn't cry so much as I expected." So they shook hands, and then the Knight rode slowly away into the forest. "It won"t take long to see him off, I expect," Alice said to herself, as she stood watching him. "There he goes! Right on his head as usual! However, he gets on again pretty easily -- that comes of having so many things hung round the horse -- -" So she went on talking to herself, as she watched the horse walking leisurely along the road, and the Knight tumbling off, first on one side and then on the other. After the fourth or fifth tumble he reached the turn, and then she waved her handkerchief to him, and waited till he was out of sight. she bounded across and threw herself down to rest on a lawn as soft as moss, with little flower-beds dotted all about it here and there. "Oh, how glad I am to get here! And what is this on my head?" she exclaimed in a tone of dismay, as she put her hands up to something very heavy, that fitted tight round her head. "But how can it have got there without my knowing it?" she said to herself, as she lifted it off, and set it on her lap to make out what it could possibly be. It was a golden crown. "WELL, this is grand!" said Alice. "I never expected I should be a Queen so soon -- and I'll tell you what it is, your Majesty," she went on in a severe tone (she was always rather fond of scolding hersef), "it'll never do to loll about on the grass like that! Queens have to be dignified, you know"
So she got up and walked about -- rather stiffly just at first, as she was afraid that the crown might come off: but she comforted herself with the thought that there was nobody to see her, "and if I really am a Queen," she said as she sat down again, "I shall be able to manage it quite well in time." and the White Queen sitting close to her, one on each side: she would have liked very much to ask them how they came there, but she feared it would not be quite civil. However, there would be no harm, she thought, in asking if the game was over. "Please, would you tell me -- -" she began, looking timidly at the Red Queen. "Speak when you're spoken to!" the Red Queen sharply interrupted her. 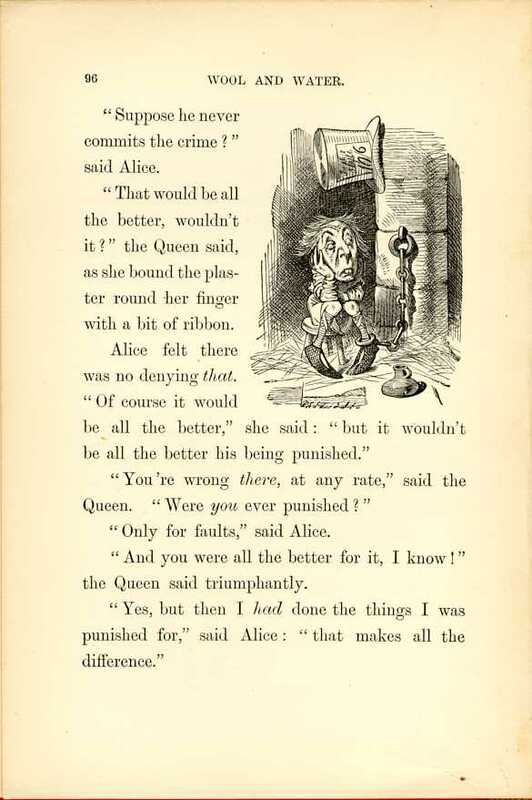 "But if everybody obeyed that rule," said Alice, who was always ready for a little argument, "and if you only spoke when you were spoken to, and the other person always waited for you to begin, you see nobody would ever say anything, so that -- -"
"Ridiculous!" cried the Queen. "Why, don't you see, child -- -" here she broke off with a frown, and after thinking for a minute, suddenly changed the subject of the conversation. "What do you mean by 'If you really are a Queen'? What right have you to call yourself so? You can't be a Queen, you know, till you've passed the proper examination. And the sooner we begin it, the better." The two Queens looked at each other, and the Red Queen remarked, with a little shudder, "She says she only said 'if' -- -"
"So you did, you know," the Red Queen said to Alice. "Always speak the truth -- think before you speak -- and write it down afterwards." "I'm sure I didn't mean -- -" Alice was beginning, but the Red Queen interrupted. "That's just what I complain of! You should have meant! What do you suppose is the use of a child without any meaning? Even a joke should have some meaning -- and a chiId's more important than a joke, I hope. You couldn't deny that, even if you tried with both hands." said you couldn't if you tried." "She's in that state of mind," said the White Queen, "that she wants to deny something -- only she doesn't know what to deny!" The White Queen smiled feebly, and said, "And I invite you." "Manners are not taught in lessons," said Alice. "Lessons teach you to do sums, and things of that sort." "Can you do Addition?" the White Queen asked. "What's one and one and one and one and one and one and one and one and one and one?" "Nine from eight I can't, you know," Alice replied very readily: "but -- -"
"She can't do Subtraction," said the White Queen. "Can you do Division? Divide a loaf by a knife -- what's the answer to that?" bone from a dog. What remains?" Alice considered. "The bone wouldn't remain, of course, if I took it -- and the dog wouldn't remain; it would come to bite me -- and I'm sure I shouldn't remain!" 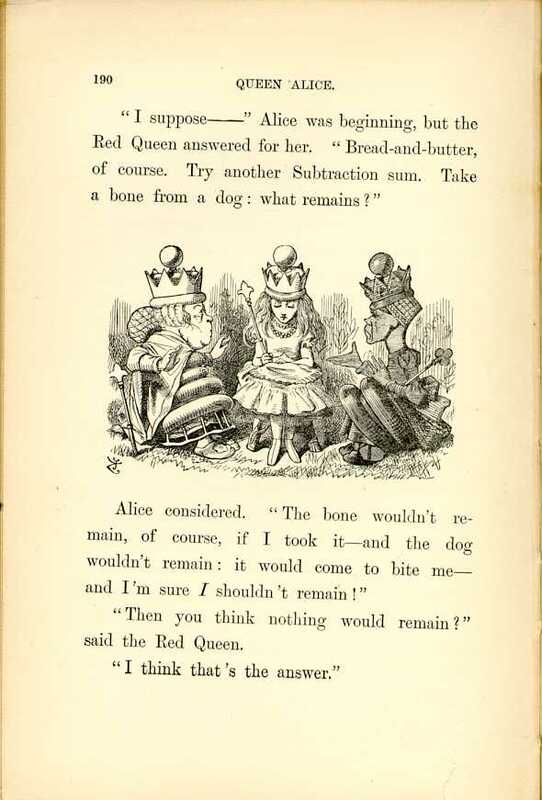 "Wrong, as usual," said the Red Queen; "the dog's temper would remain." "But I don't see how -- -"
"Then if the dog went away, its temper would remain!" the Queen exclaimed. The Queen gasped and shut her eyes. "I can do Addition," she said, "if you give me time -- but I can't do Subtraction under any circumstances! " "To be sure I do," said Alice. "So do I," the White Queen whispered. "We'll often say it over together, dear. And I'll tell you a secret -- I can read words of one letter! Isn't that grand? However, don't be discouraged. You'll come to it in time." "I know that!" Alice cried eagerly. "You take some flour -- -"
"Well, it isn't picked at all," Alice explained: "it's ground- -- "
"Fan her head!" the Red Queen anxiously interupted. "She'll be feverish after so much thinking." So they set to work and fanned her with bunches of leaves, till she had to beg them to leave off, it blew her hair about so. "She's all right again now," said the Red Queen. "Do you know Languages? What's the French for fiddle-de-dee ?" "Who said it was?" said the Red Queen. Alice thought she saw a way out of the difficulty this time. "If you'll tell me what language "fiddle-de-dee' is, I'll tell you the French for it!" she exclaimed triumphantly. But the Red Queen drew herself up rather stiffly, and said, "Queens never make bargains." in an anxious tone. "What is the cause of lightning ?" 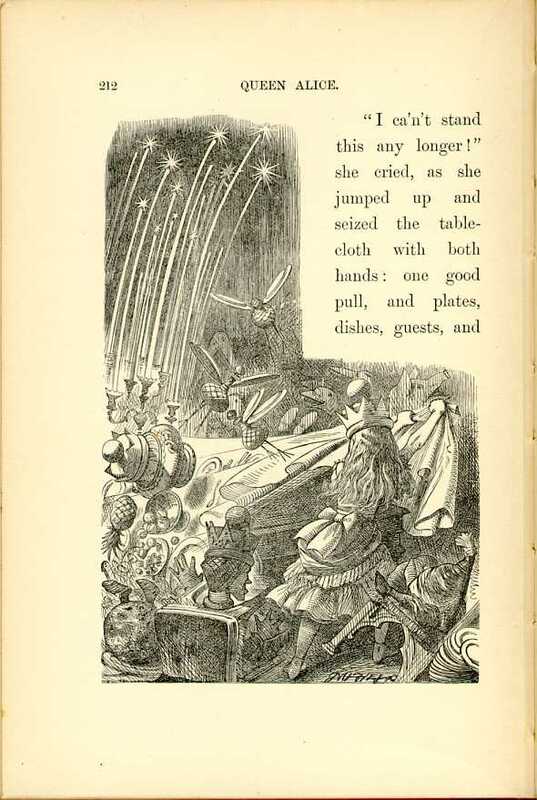 "The cause of lightning," Alice said very decidedly, for she felt quite sure about this, "is the thunder -- no, no!" she hastily corrected herself. "I meant the other way." "Which reminds me -- " the White Queen said, looking down and nervously clasping and unclasping'her hands, "we had such a thunderstorm last Tuesday -- I mean one of the last set of Tuesdays, you know." "In our country," Alice remarked, "there's only " one day at a time." The Red Queen said. "That's a poor thin way of doing things. Now here, we mostly have days and nights two or three at a time, and sometimes in the winter we take as many as five'nights together -- for warmth, you know." "But they should be five times as cold, by the same rule -- -"
"just so!" cried the Red Queen. "Five times as warm, and five times as cold -- just as I'm five times as rich as you are, and five times as clever!" "Humpty Dumpty saw it too," the White Queen went on in a low voice, more as if she were talking to herself. "He came to the door with a corkscrew in his hand -- -"
"What for?" said the Red Queen. "Is there generally ?" Alice asked in an astonished tone. "I know what he came for," said Alice: "he wanted to punish the fish, because -- -"
a thunderstorm, you can't think!" ("She never could, you know," said the Red Queen.) "And part of the roof came off, and ever so much thunder got in -- and it went rolling round the room in great lumps -- and knocking over the tables and things -- till I was so frightened, I couldn't remember my own name!" The White Queen looked timidly at Alice, who felt she ought to say something kind, but really couldn't think of anything. pleased she'll be!" But this was more than Alice had courage to do. "A little kindness -- and putting her hair in papers -- would do wonders with her -- -"
The White Queen gave a deep sigh, and laid her head on Alice's shoulder. "I am so sleepy!" she moaned. "She"s tired, poor thing!" said the Red Queen, "Smooth her hair -- lend her your nightcap -- and sing her a soothing lullaby." as she tried to obey the first direction: "and I don't know any soothing lullabies." Red Queen, and White Queen, and Alice, and all!. "And now you know the words," she added, as she put her head down on Alice's other shoulder, "just sing it through to me. I'm getting sleepy too." In another moment both Queens were fast asleep, and snoring loud. in an impatient tone; but there was no answer but a gentle snoring. The snoring got more distinct every minute, and sounded more like a tune: at last she could even make out words, and she listened so eagerly that when the two great heads suddenly vanished from her lap, she hardly missed them. She was standing before an arched doorway, over which were the words QUEEN ALICE in large letters, and on each side of it there was a bell-handle ; one marked "Visitors' Bell," and the other "Servants' Bell." "I'll wait till the song's over," thought Alice, "and then I'll ring the -- the -- which bell must ring?" she went on, very much puzzled by the names. "I'm not a visitor, and I'm not a servant. There ought to be one marked "Queen,' you know -- -"
Just then the door opened a little way, and a creature with a long beak put its head out for a moment and said, "No admittance till the week after next!" and shut the door again with a bang. 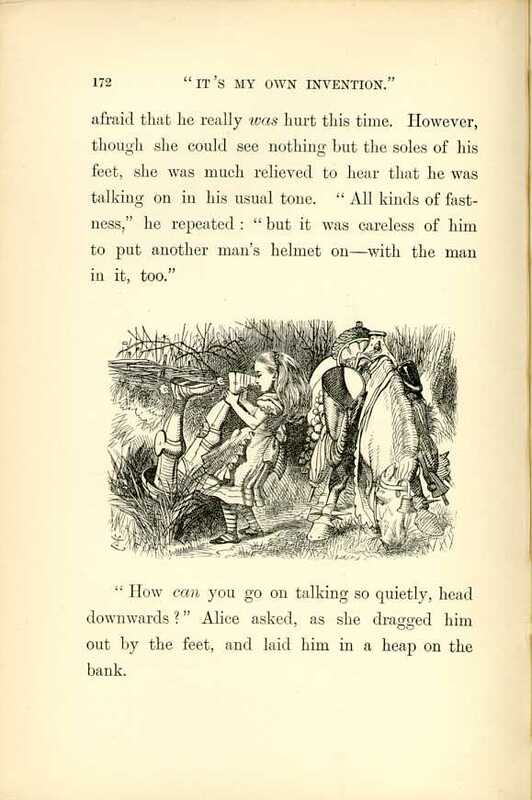 Alice knocked and rang in vain for a long time, but at last a very old Frog, who was sitting under a tree, got up, and hobbled slowly towards her : he was dressed in bright yellow, and had enormous boots on. "What is it now?" the Frog said in a deep hoarse whisper. Alice almost stamped with irritation at the slow drawl in which he spoke. "This door, of course! The Frog looked at the door with his large dull eyes for a minute : then he went nearer and rubbed it with his thumb, as if he were trying whether the paint would come off; then he looked at Alice. "To answer the door?" he said. "What's it been asking of?" He was so hoarse that Alice could scarcely hear him. "I speaks English, doesn't I?" the Frog went on. "Or are you deaf? What did it ask you?" "Shouldn't do that -- shouldn't do that -- " the Frog muttered. "Wexes it, you know." Then he went up and gave the door a kick with one off his great feet. "You let it alone," he panted out, as he hobbled back to his tree, "and it'll let you alone, you know." 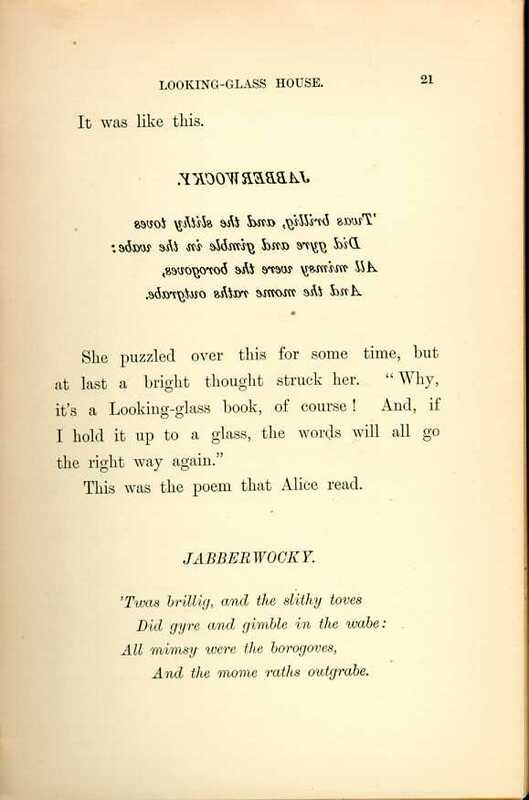 "`O Looking-glass creatures,' quoth Alice, `draw near! And welcome Queen Alice with ninety-times-nine"
"Ninety-times-nine!" Alice repeated in despair. "Oh, that'll never be done! I'd better go in at once -- " and in she went, and there was a dead silence the moment she appeared. There were three chairs at the head of the table; the Red and White Queens had taken two of them, but the middle one was empty. Alice sat down, rather uncomfortable at the silence, and longing for someone to speak. At last the Red Queen began. "You've missed the soup and fish," she said. "Put on the joint!" 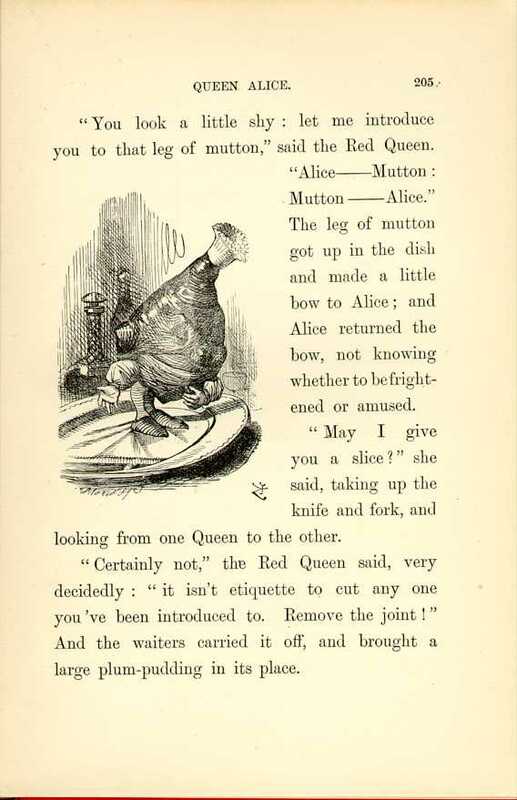 And the waiters set a leg of mutton before Alice, who looked at it rather anxiously, as she had never had to carve one before. she returned the bow, not knowing whether to be frightened or amused. introduced to. Remove the joint!" And the waiters carried it off, and brought a large plum-pudding in its place. But the Red Queen looked sulky, and growled, "Pudding -- Alice; Alice -- Pudding. Remove the pudding!" and the waiters took it away before Alice could return its bow. However, she didn't see why the Red Queen should be the only one to give orders, so, as an experiment, she called out, "Waiter! Bring back the pudding!" and there it was again in a moment, like a conjuring trick. It was so large that she couldn't help feeling a little shy with it, as she had been with the mutton; however, she conquered her shyness by a great effort, and handed a slice to the Red Queen. "What impertinence!" said the Pudding. " I wonder how you'd like it, if I were to cut a slice out of you, you creature!" Alice could only look at it and gasp. "Do you know, I've had such a quantity of poetry repeated to me to-day," Alice began, a little frightened at finding that, the moment she opened her lips, there was dead silence, and all eyes were fixed upon her; "and it's a very curious thing, I think -- every poem was about fishes in some way. Do you know why they're so fond of fishes, all about here?" She spoke to the Red Queen, whose answer was a little wide of the mark. "As to fishes," she said, very slowly and solemnly, putting her mouth close to Alice's ear, "her White Majesty knows a lovely riddle -- all in poetry -- all about fishes. Shall she repeat it?" Ah that is so hard that I fear I'm unable! un-dish-cover the fish, or dish-cover the riddle?" and began to lap up the gravy, "just like pigs in a trough!" thought Alice. 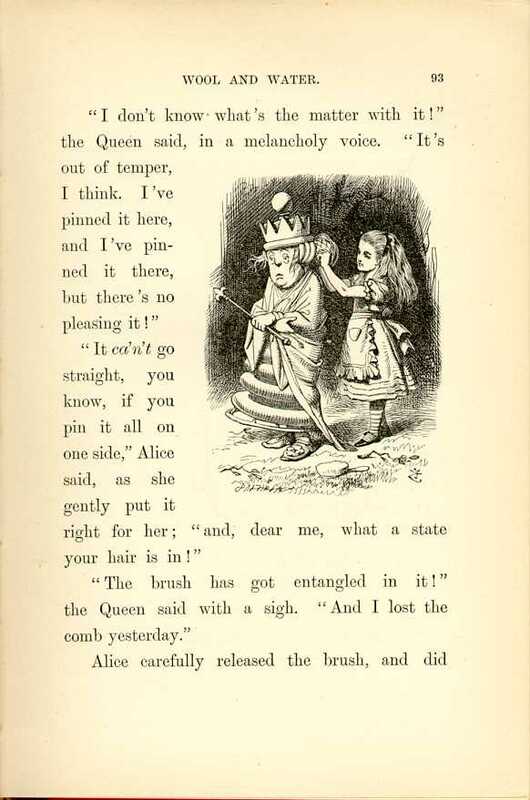 "You ought to return thanks in a neat speech," the Red Queen said, frowning at Alice as she spoke. "We must support you, you know," the White Queen whispered, as Alice got up to do it, very obediently, but a little frightened. In fact it was rather difficult for her to keep in her place while she made her speech: the two Queens pushed her so, one on each side, that they nearly lifted her up into the air: "I rise to return thanks -- " Alice began: and she really did rise as she spoke, several inches; but she got hold of the edge of the table, and managed to pull herself down again. And then (as Alice afterwards described it) all sorts of things happened in a moment. The candles grew up to the ceiling, looking something like a bed of bushes with fireworks at the top. 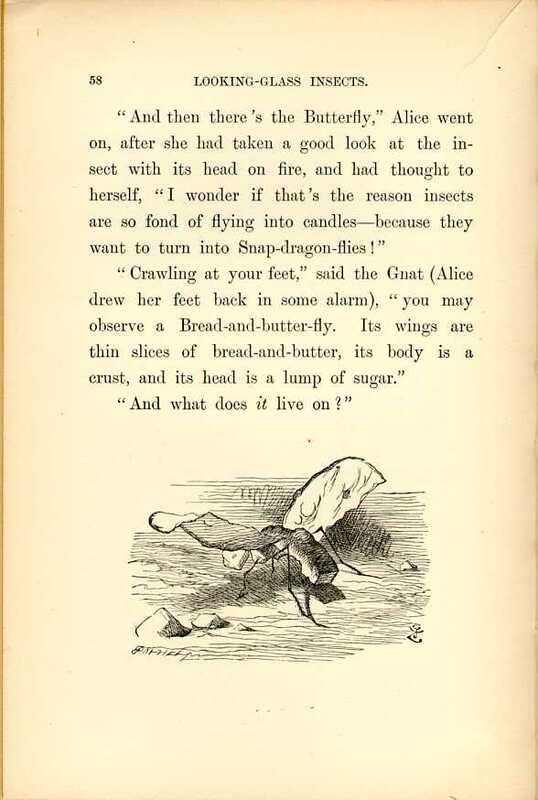 As to the bottles, they each took a pair of plates, which they hastily fitted on as wings, and so, with forks for legs, went fluttering about: "and very like birds they look," Alice thought to herself, as well as she could in the dreadful confusion that was beginning. At this moment she heard a hoarse laugh at her side, and turned to see what was the matter with the White Queen; but, instead of the Queen, there was the leg of mutton sitting in the chair. "Here I am!" cried a voice from the soup-tureen, and Alice turned again, just in time to see the Queen's broad good-natured face grinning at her for a moment over the edge of the tureen, before she disappeared into the soup. several of the guests were lying down in the dishes, and the soup-ladle was walking up the table to Alice, and signing to her to get out of its way. pull, and plates, dishes, guests, and candles came crashing down together in a heap on the floor. "And as for you," she went on, turning fiercely upon the Red Queen, whom she considered as the cause of all the mischief -- but the Queen was no longer at her side -- she had suddenly dwindled down to the size of a little doll, and was now on the table, merrily running round and round after her own shawl, which was trailing behind her. -- and it really was a kitten, after all. YOUR Red Majesty shouldn't purr so loud," Alice said, rubbing her eyes, and addressing the kitten respectfully, yet with some severity. "You woke me out of -- oh! such a nice dream! And you've been along with me, Kitty -- all through the Looking-glass world. Did you know it, dear?" It is a very inconvenient habit of kittens (Alice had once made the remark) that, whatever you say to them, they always purr. "If they would only purr for "yes,' and mew for "no,' or any rule of that sort," she had said, "so that one could keep up a conversation! But how can you talk with a person if they always say the same thing?" So Alice hunted among the chessmen on the table till she had found the Red Queen: then she went down on her knees on the hearthrug, and put the Kitten and the Queen to look at each other. "Now, Kitty!" she cried, clapping her hands triumphantly. "You've got to confess that that was what you turned into!" "Sit up a little more stiffly, dear!" Alice cried with a merry laugh. "And curtsey while you're thinking what to -- what to purr. It saves time, remember!" And she caught it up in her arms, and gave it one little kiss "just in honour of its having been a Red Queen, you know!" scrubbing a White Queen? Really, it's most disrespectful you, and I'm quite surprised at you!" you'd better not mention it to your friends just yet, for I"m not sure. "By the way, Kitty, if only you'd been really with me in my dream, there was one thing you would have enjoyed -- I had such a quantity of poetry said to me, all about fishes! To-morrow morning you shall have a real treat. All the time you're eating your breakfast, I'll repeat "The Walrus and the Carpenter" to you; and then you can make believe it's oysters, my dear! "Now, Kitty, let's consider who it was that dreamed it all. This is a serious question, my dear, and you should not go on licking your paw like that -- as if Dinah hadn't washed you this morning! You see, Kitty, it must have been either me or the Red King. He was part of my dream, of course -- but then I was part of his dream, too! Was it the Red King, Kitty? You were his wife, my dear, so you ought to know -- oh, Kitty, do help to settle it! I'm sure your paw can wait!" But the provoking kitten only began on the other paw, and pretended it hadn't heard the question.